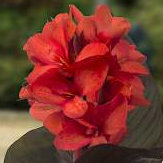 During the year we will be adding more varieties as they become available for sale. we may also be delete varieties when our stocks run low. Important: Mild weather at this time of year can be deceptive. 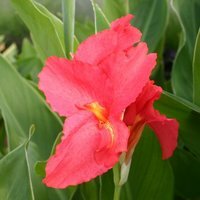 A late frost will damage foliage. 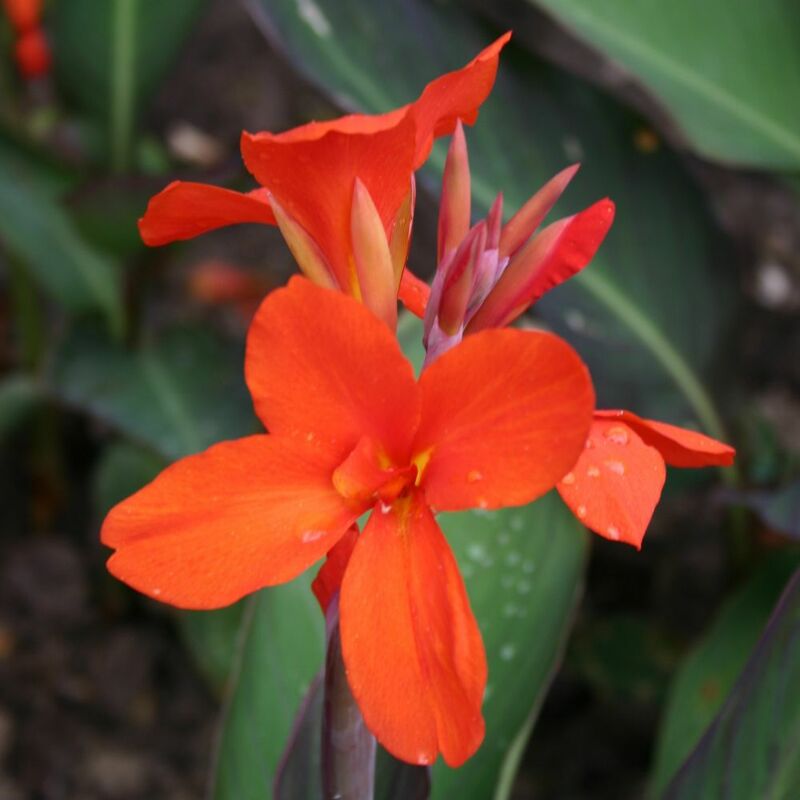 We recommend not planting cannas outdoors until mid May in most areas, and later in the north. 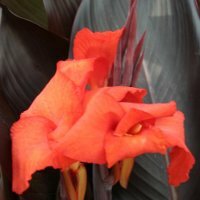 All the cannas that we sell are our own production. 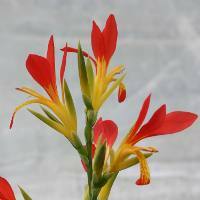 What we sell are small plants, or a rhizome with new roots and at least one new shoot. All are personally selected to be actively growing. This is the genetic material out of which you will get a gorgeous variety, correctly named, and healthy. It will multiply during the year. Please note that we are not in the business of producing high volumes of plants. Anyone ordering more than a few of a particular variety may find that were unable to supply. For higher quantities please phone or email us. 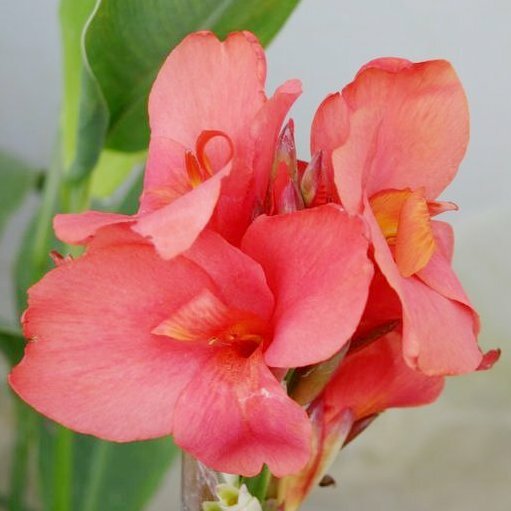 For those with a little patience, we recommend customers to not aim for a big show of one variety the first year, but to rely on the propensity of cannas to multiply for future years. Please note that we do not sell dormant rhizomes. 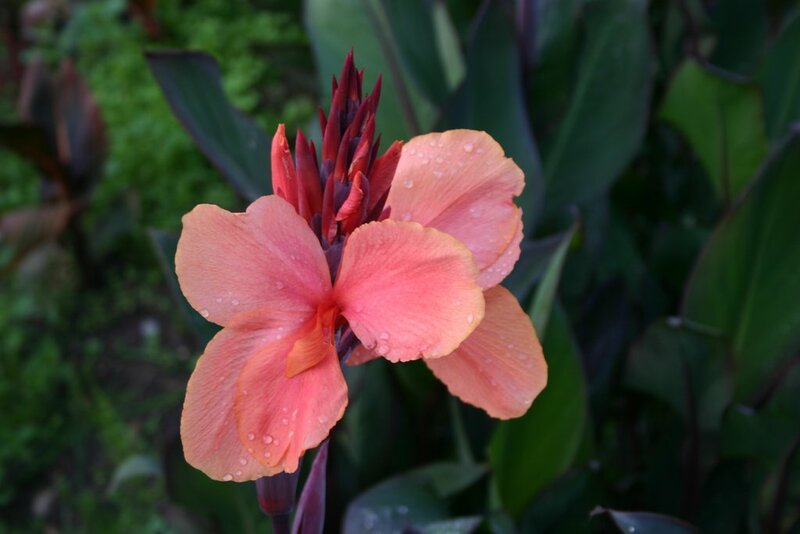 In nature cannas grow in the tropical parts of central and south America, and in the West Indies. 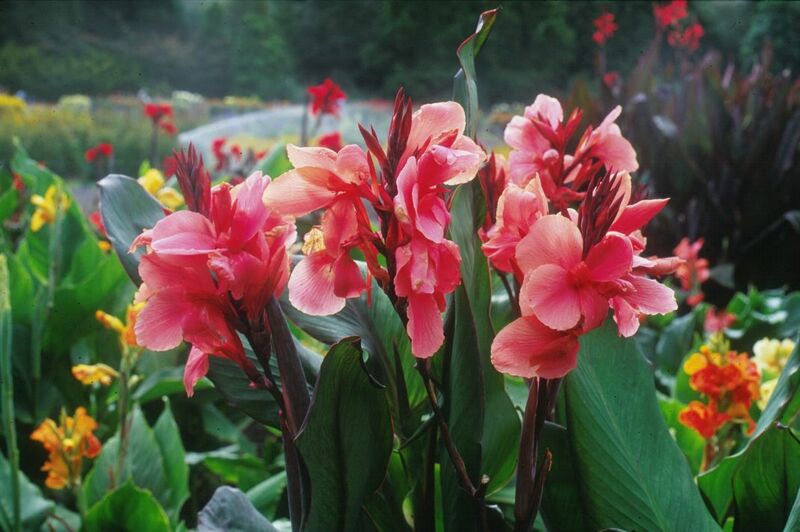 These countrues rarely if ever experience frost, and so cannas never become dormant. If forced into dormancy, many rhizomes die. 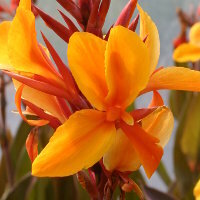 Forcing cannas into dormancy is an innovation introduced by the horticulture trade to enable rhizomes to be sold in temperate countrues during the winter months. 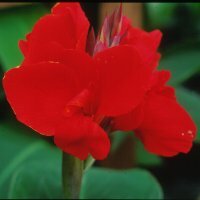 Our pricing policy is that we charge a little more for varieties that are more trouble for us to propagate, which generally are the bigger varieties, or for varieties that we are relatively short of. We charge a little less for short varieties which bulk up quickly. 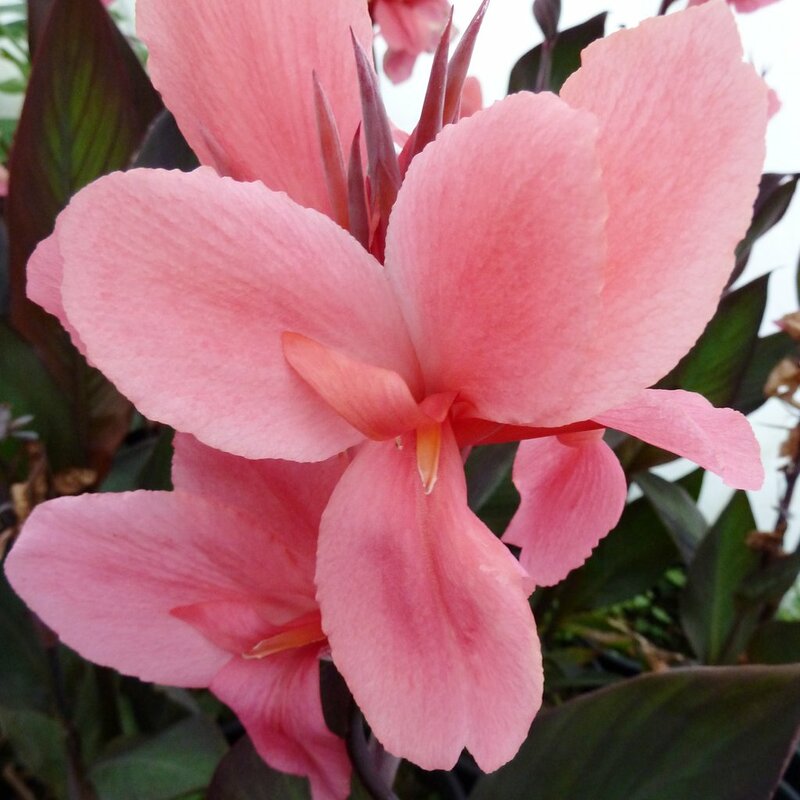 Customers purchasing cannas in autumn/winter should grow them under glass and in a frost-free environment until next spring. We recommend not planting them outside until mid May in most areas. 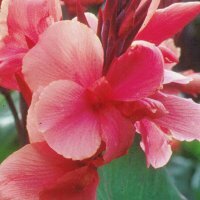 They should be potted-on as soon as received, well watered, and given a little tlc (tender loving care) until they become established. They are not suitable for onward storage. We prefer customers to order on-line where possible. The sale is then fully documented and we don't need to handle credit card information (which is securely handled by our Shopping Cart provider). 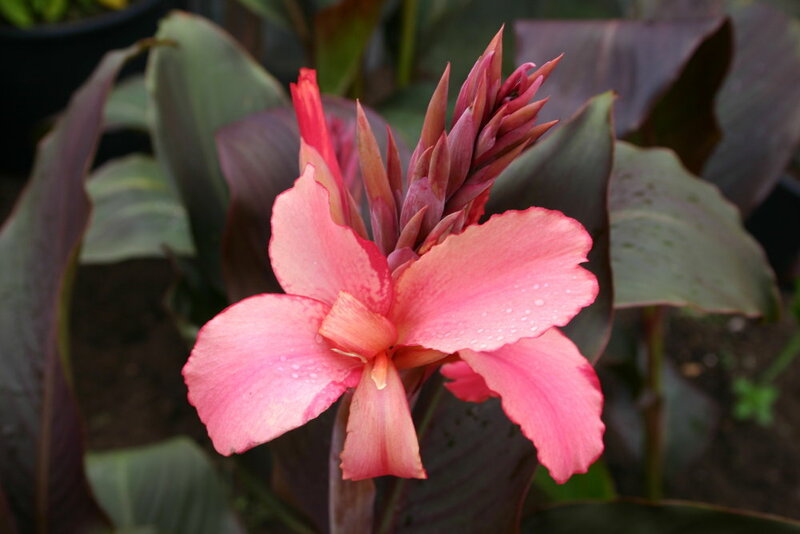 We despatch cannas as soon as ordered where practical, and we notify customers of the date of despatch. 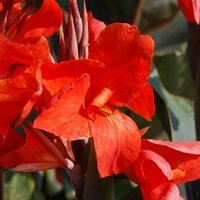 Callers to our nursery are welcome by arrangement. 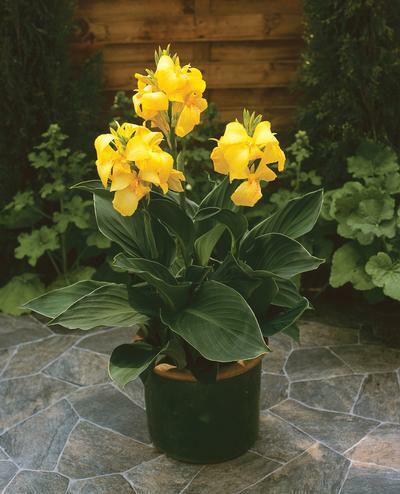 An advantage of UK membership of the European Union (EU) is that we can send living plants to anywhere within the EU with no need for import/export documentation (which is prohibitively expensive to obtain). 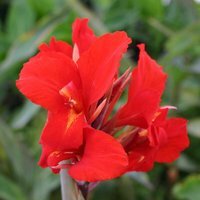 We can not supply cannas to any country outside the EU. Green foliage and nice peach flowers. 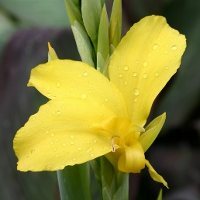 There is no truly white canna. 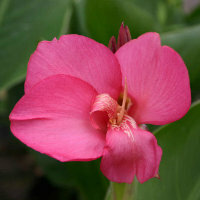 This variety has large nicely shaped flowers with a touch of pink in the centre. 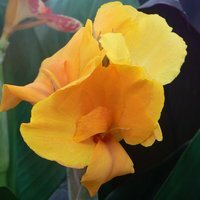 A unique canna with a unique history. 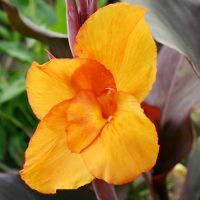 It is the tallest of the canna garden cultivars, and truly spectacular, with large, lance shaped glaucous leaves, and delicate apricot flowers. Extremely vigorous, it soon produces a large clump. The story of 'Annei' is well documented. It was bred by Théodore Année in France in 1848. 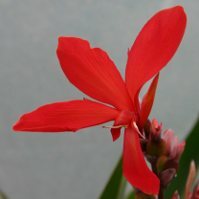 Année had worked as a diplomat in Chile, where he became familiar with cannas, and in retirement in France he devoted his time to breeding cannas. 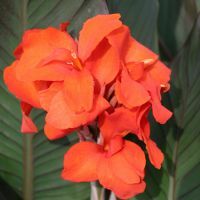 This variety was his first success, and it seems to have the distinction of being the very first named variety of canna. It was launched onto an amazed Parisian public a few years later and became an immediate success. 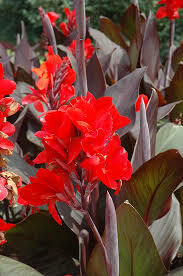 It is reported that in the year 1861 some 20,000 "tufts" of canna 'Annei' were grown in the squares of Paris. (ref: Chaté, E. (1867) Le Canna, son histoire, sa culture). 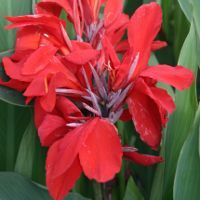 We grew this variety many years ago, having originally acquired it from a French source, but it was lost due to virus. Imagine our joy when a customer in Italy sent us a few healthy rhizomes. 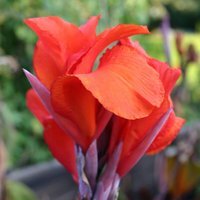 Those familiar with cannas will recognise a similarity with 'Stuttgart', in the flowers, foliage, and enormously long rhizomes. 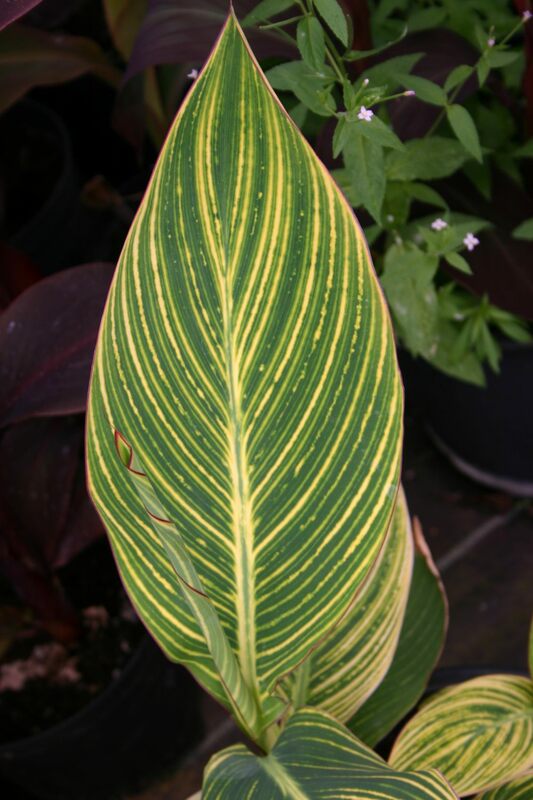 Essentially, it seems to be 'Stuttgart' but without the white stripes in the leaves. 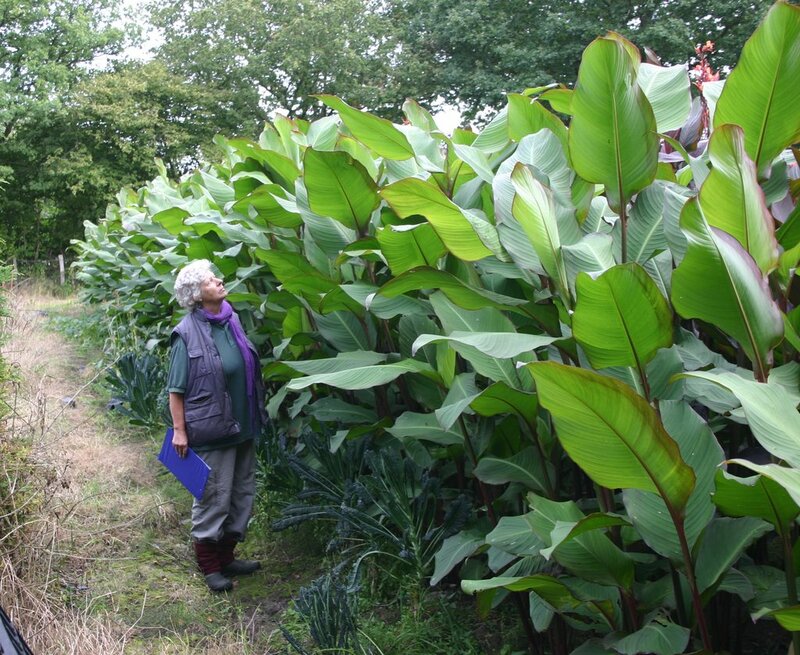 This absence of white in the leaves no doubt results in increased vigour giving a bigger plant. Known as 'Omega' in the USA. Black Knight is very similar, in fact it takes an expert to see the difference. 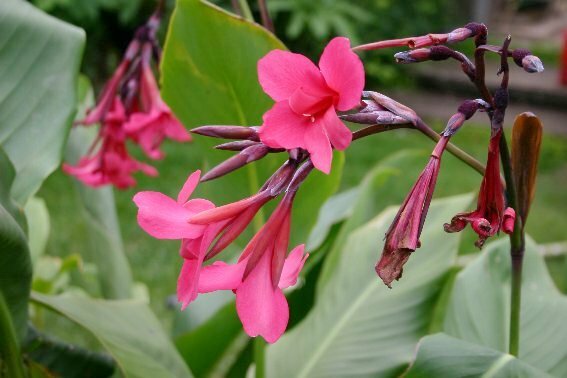 Flower: Dark pink, some would call it red. An old variety, and one of the best. Low stocks, hence higher price. 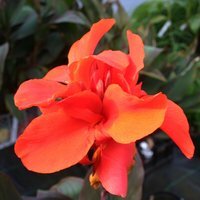 This is the true 'Australia', reputed to be the darkest leaf of any canna. A tall and slender plant. May sometimes need staking. 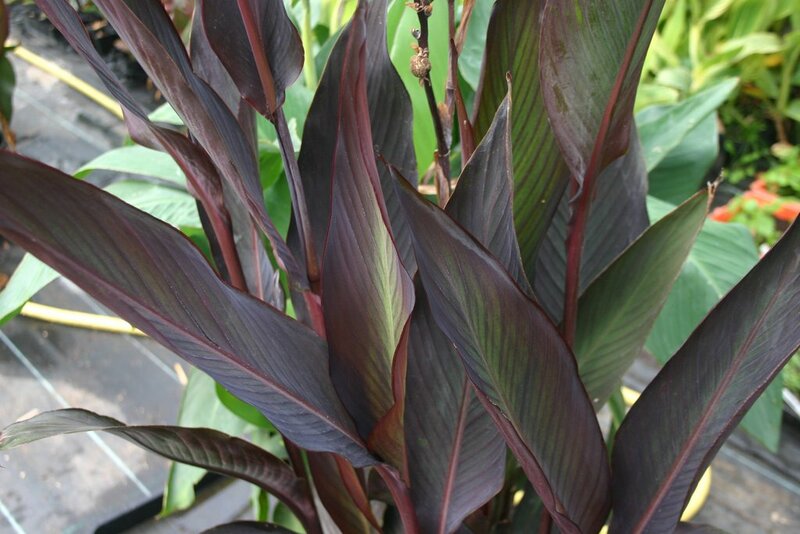 Foliage: Very dark shiny chocolate colour. 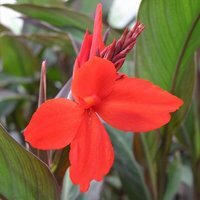 Buyer Beware: A different canna is being offered by the Garden Center Trade under the name of 'Australia'. 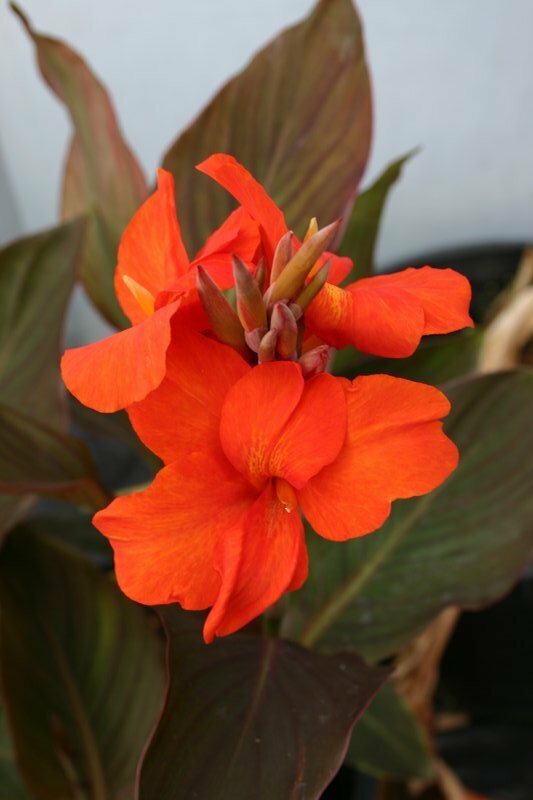 This is wrongly named, and is a short variety with not very dark foliage. Medium height. 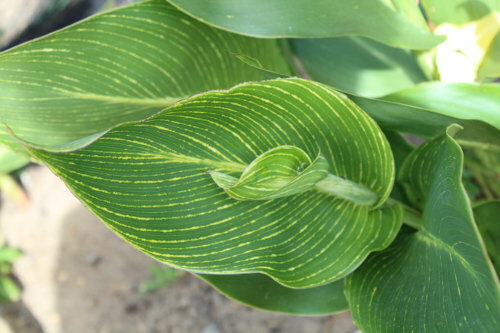 Green foliage with a fine white pinstripe. The yellow flower has a white stripe down the centrie of some petals. An old variety. Some might say that the alternative name 'Striped Beauty' is a misnoma. 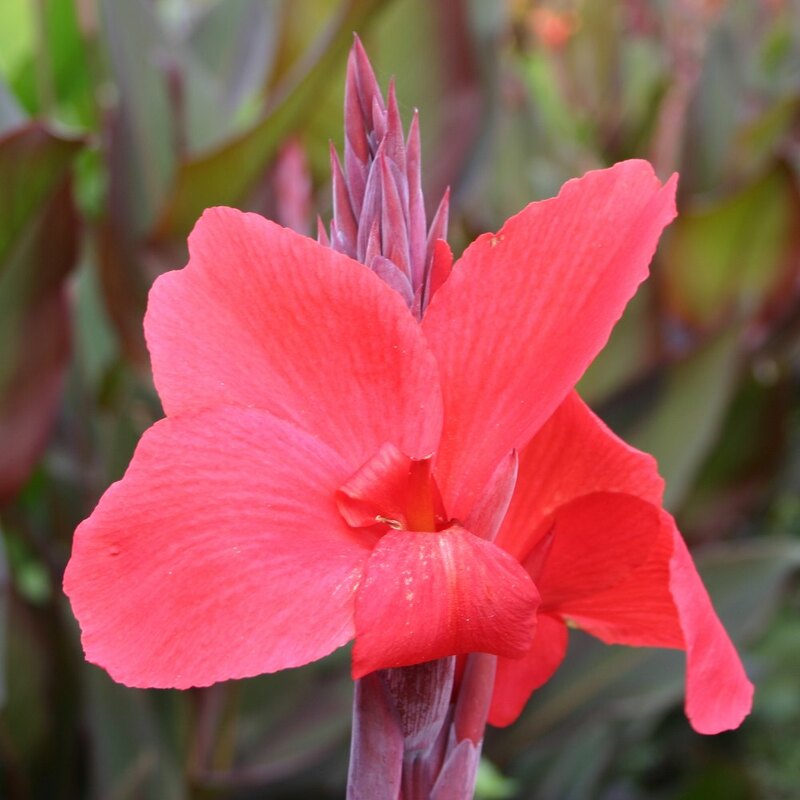 In the world of cannas, where beauty is commonplace, it is not outstandingly beautiful. Neither is it very striped. But there is no doubt that it is unique. Very tall (2m). 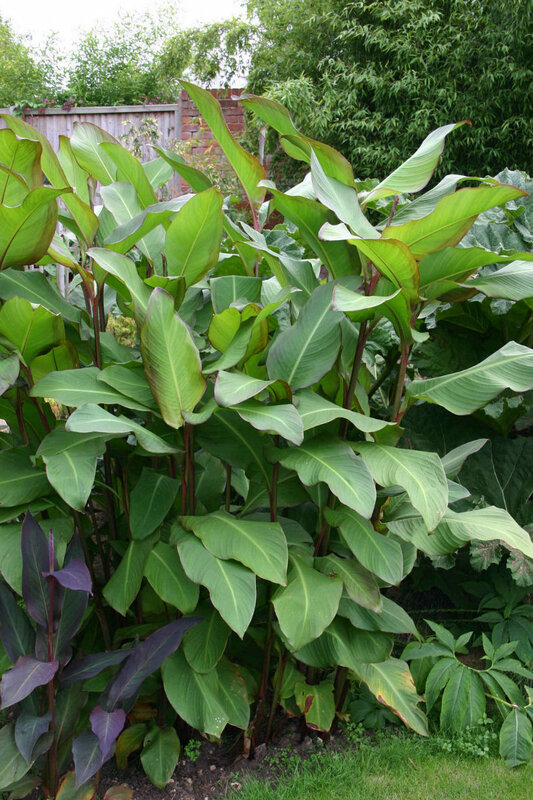 A slender plant with narrow lance shaped leaves in shades of green with pink blush. Coloured stems. Small pink flowers. Can sometimes be rather straggly, and need staking. 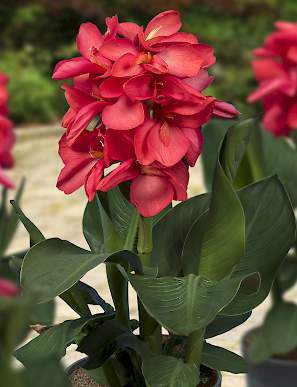 A novelty variety for the connoiseur, but we confess not one of our favourites. 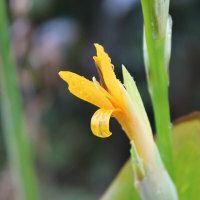 The young plants are very thin, about the shape and size of a pencil. But customers ask for it, so here it is. 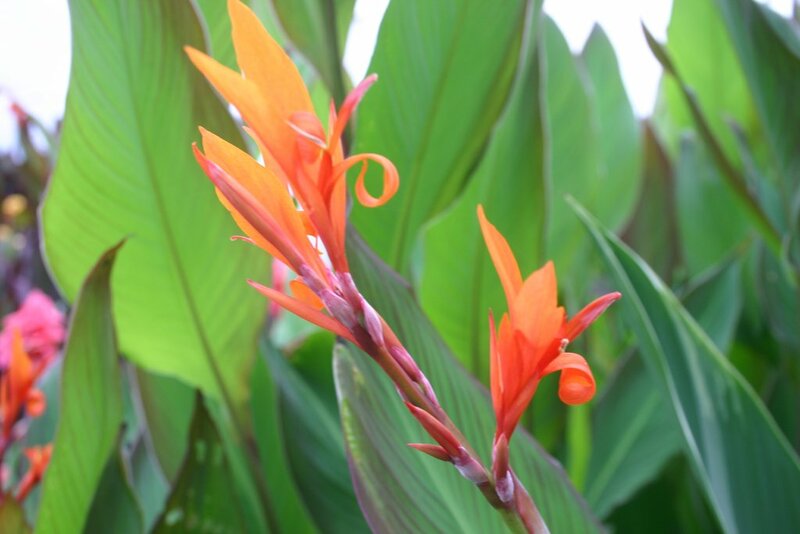 Note: this is not the Strelitzia 'Bird Of Paradise. This is the true 'Black Knight. 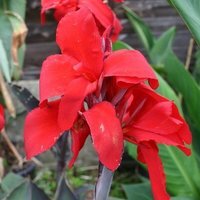 By reputation the darkest red flower of any canna. 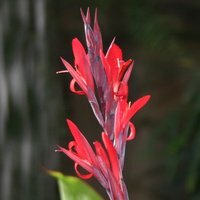 Beware other cannas on the market that are wrongly named Black Knight. 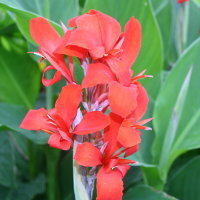 A relatively short canna with intensely red flowers and narrow lance shaped green foliage with a dark edge. This variety has small rhizomes. 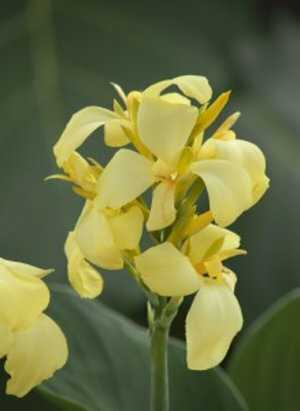 It is very bushy and produces many flowering stems. 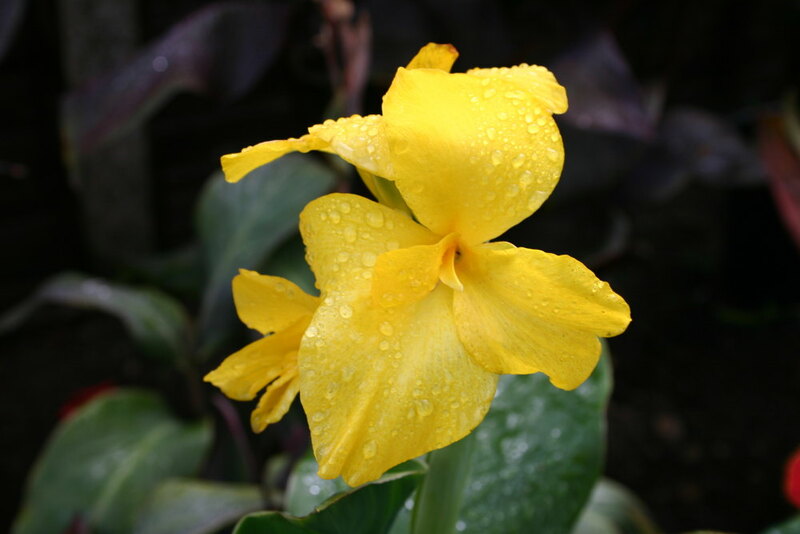 Flower: Yellow with red blotches. 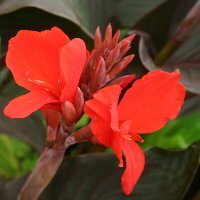 A bushy, medium height canna with dark bronze foliage and red flowers. 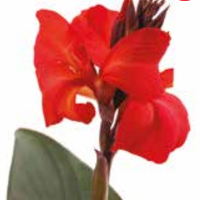 'CANNOVA' is a range of cannas bred by the Japanese company Takii, and marketed by their subsidiary in Holland. The first 3 varieties were introduced in 2014, since when more have been added. 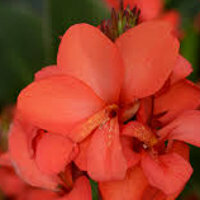 These varieties are intended for the garden centre market, and the aim is that garden centres will have small, bushy, floriferous plants ready for sale and maybe already flowering at the start of the summer selling season. 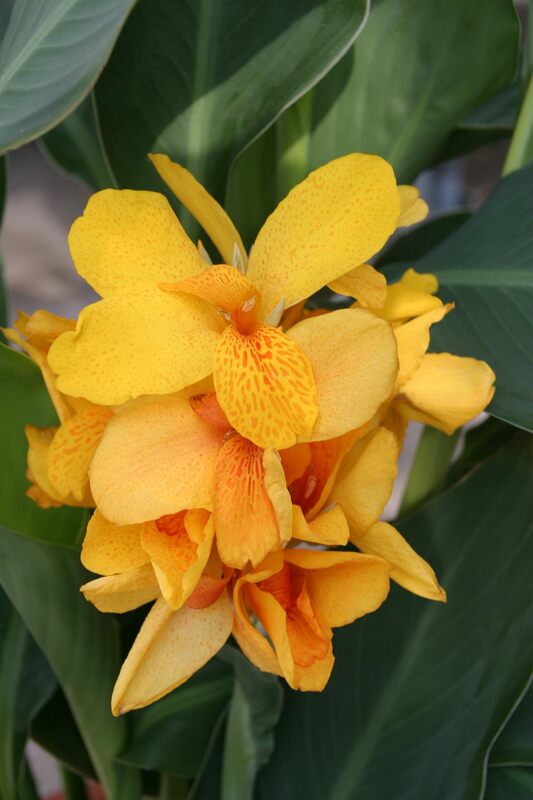 These varieties are being vigorously marketed by Takii to trade customers. A new member of the Cannova family, available for the first time in 2017. 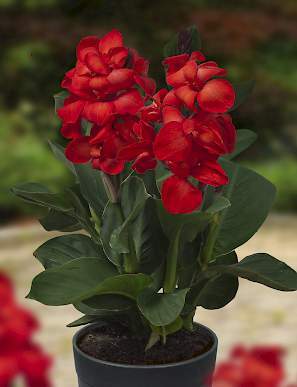 A distinctive and attractive variety, with nicely shaped flowers. We don't see any resemplance to a mango. 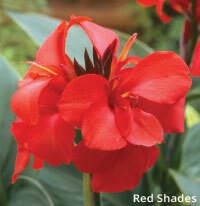 The name "shades" presumably means that the colour varies slightly, though we haven't noticed it. 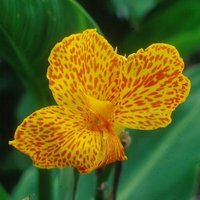 Flower: Yellow with red speckles. Flower: Various pink shades in the same flower. 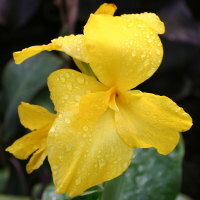 Flower: Pale yellow with pink speckling. Foliage: Green, bronze, or both . 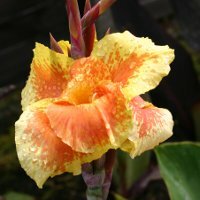 Flower: Yellow with speckles, and/or red. 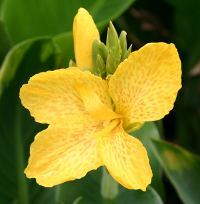 A "Chimaera", the flowers can be red or yellow, and often are partly red and partly yellow. 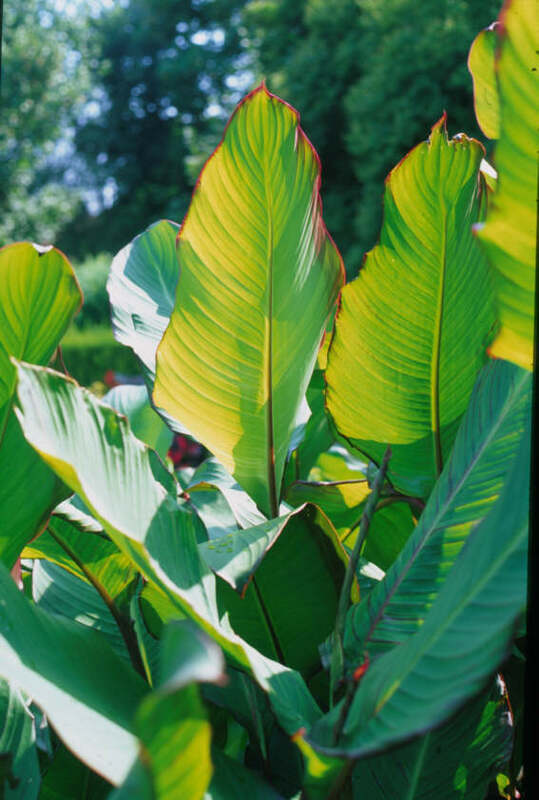 Similarly, the foliage can be green, or can be green with chocolate streaks. 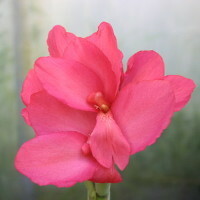 Amazingly, sometimes a leaf or a petalis divided down the centre, one half one colour, the other half another. 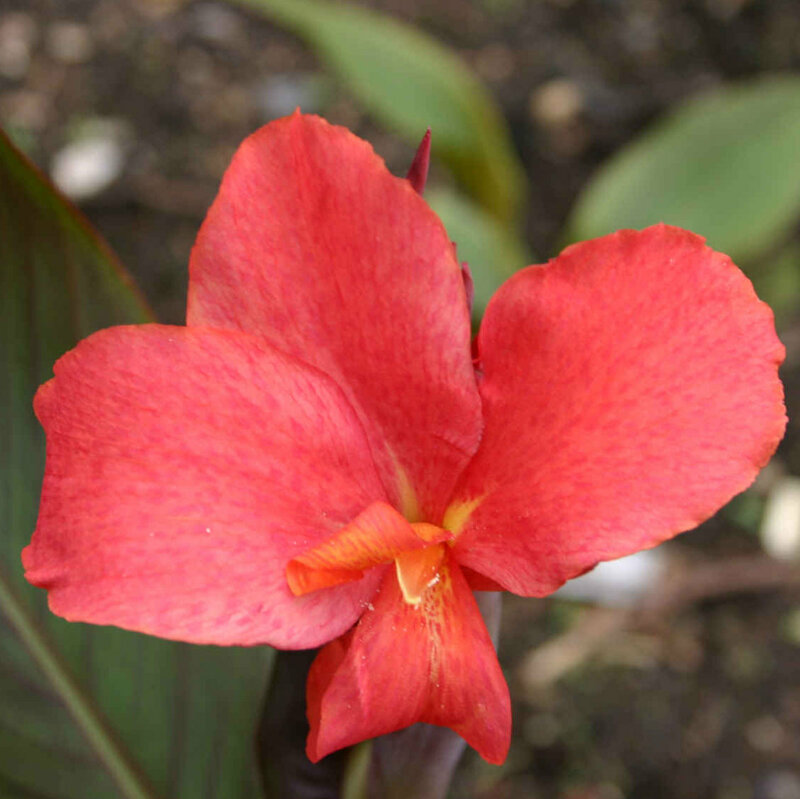 Sometimes the flower is completely red and the foliage completely chocolate, and then it is identical to 'General Eisenhower'. One of the original heritage "Island" series. 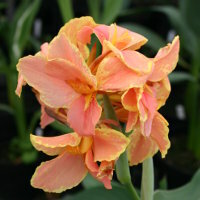 Others in the series are 'Gran Canaria' 'Kreta' and 'Madeira' which we hope to have in this catalogue before very long. We don't have 'Tenerife'. If anyone has it, please send us one. 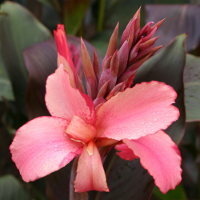 Also known as 'Phasion', Tropicanna (TM). 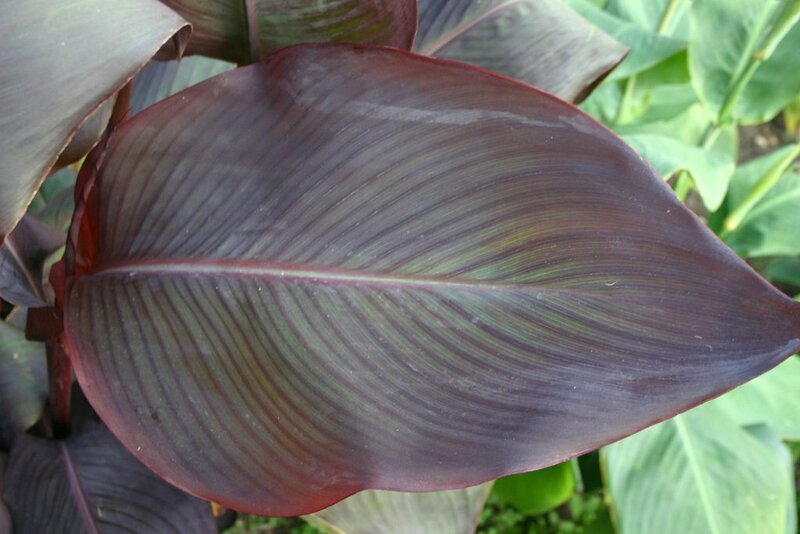 Foliage: Burgundy with pink stripes. . 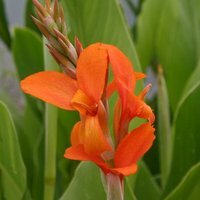 The most popular canna of all time. 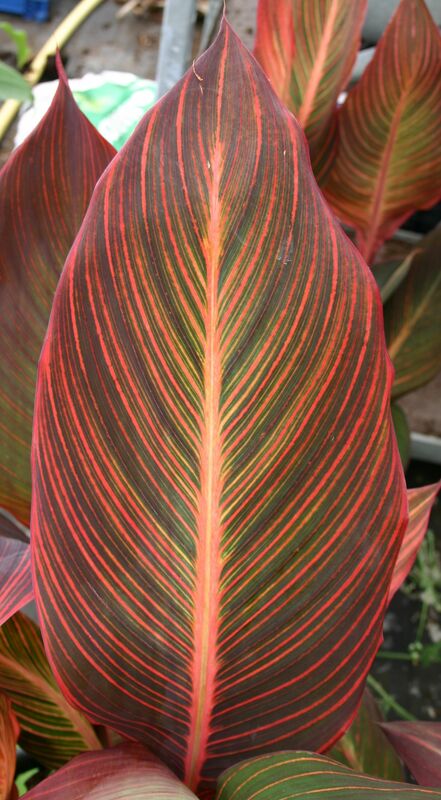 Gorgeous multi-coloured foliage. 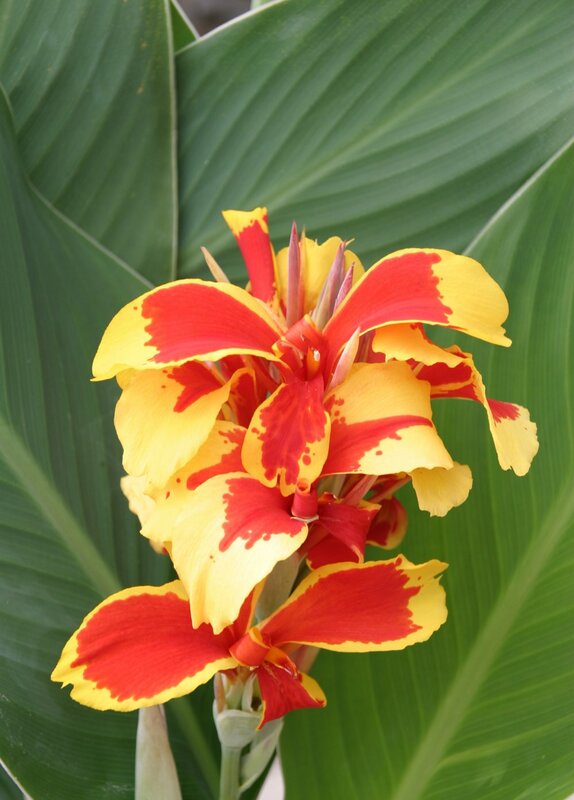 The ultimate garish canna and not for those sensitive souls who don't like clashing colours. 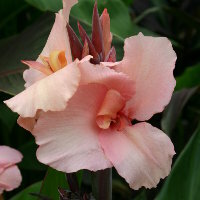 To retain the colour of the foliage, it is better grown in some dappled shade (actually, this is true of all cannas with brown or red leaves). 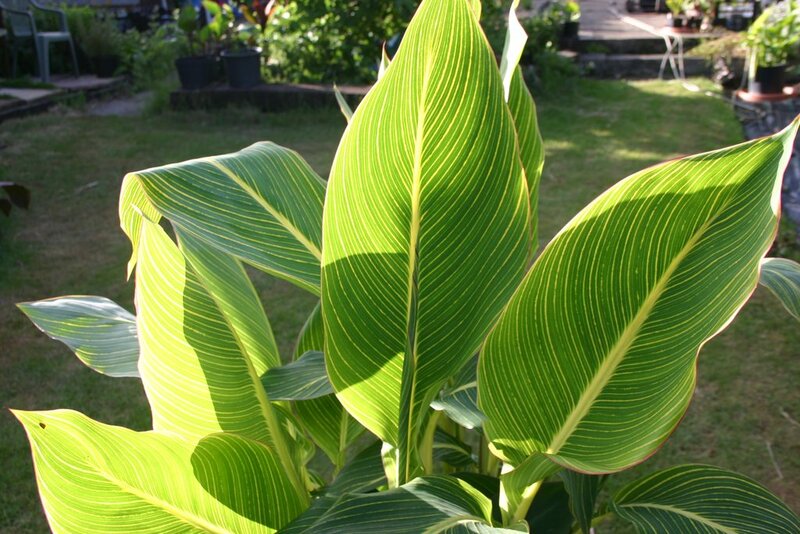 Foliage: Very large bright green leaves. RHS AGM Award 2002. An unusual but very beautiful canna. 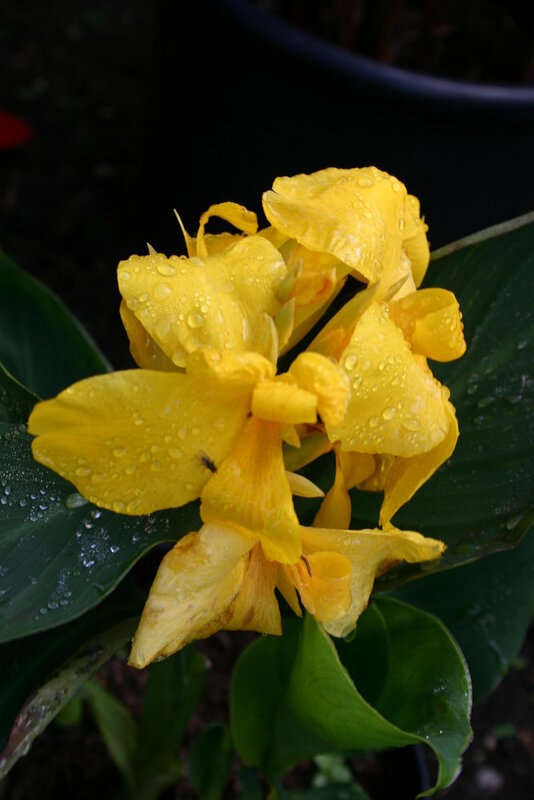 Often wrongly referred to as Canna iridiflora (it is a sterile hybrid of C. iridiflora). 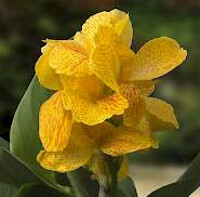 It is one of the oldest hybrids, dating from the 1860's. 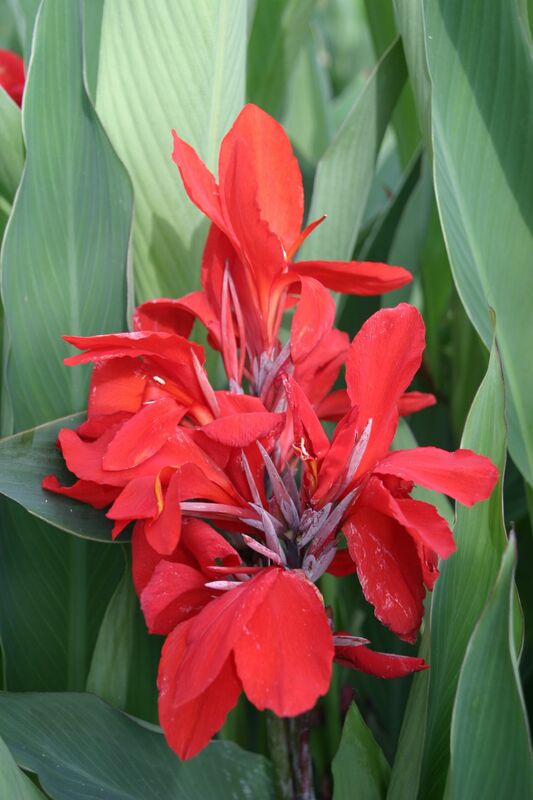 Having parentage of C. iridiflora gives it distinct characteristics of giant foliage and nodding flowers. We also feel that it is somewhat hardier than other cannas. On the downdside, the rhizomes are close-packed and woody, and difficult to divide. The parent species grows wild in the mountains of Peru from Cusco to Huanuco. It looks very much like 'Ehemannii'. We'd really appreciate some seed if anyone is out that way. 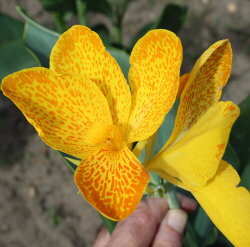 Flower: yellow with red spots. RHS AGM Award 2002. 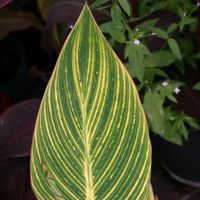 Distinctive lance-shaped foliage lightly striped bronze. 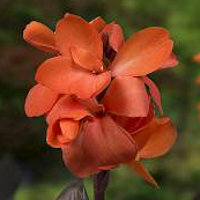 Very similar to (and may be the same as) the old variety 'Verdi'. Flower: A treu crimson red. 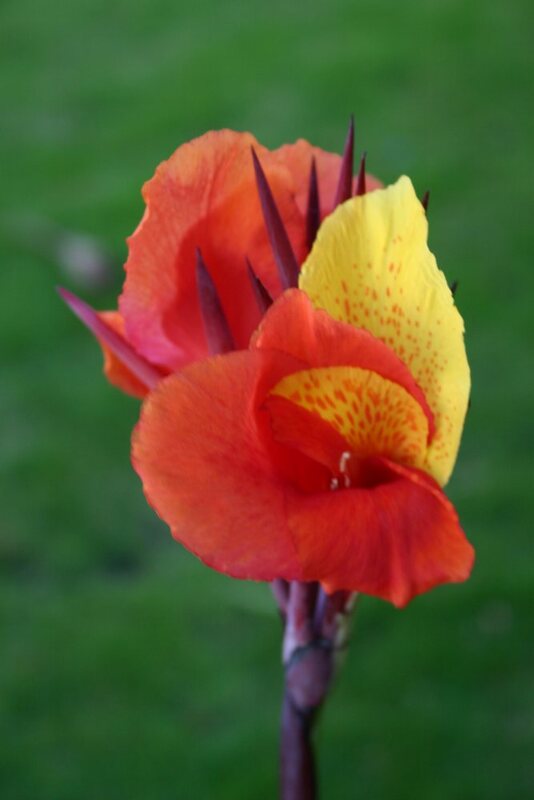 Flower: Yellow with red flash. Quite distinctive. Dark bronze foliage well-shaped foliage. 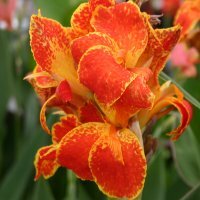 Well-shaped orange/red flowers. 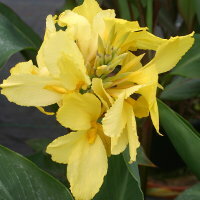 A new variety which combines a golden flower with bronze foliage. 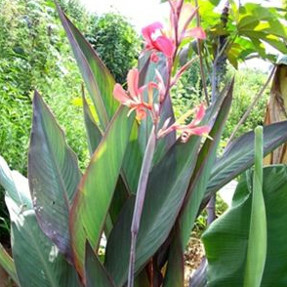 Large, well shaped flowers on a well proportioned plant with heavy foliage. One of our best varieties. 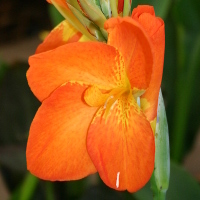 Bred by English plant breeder Jim Ranger. 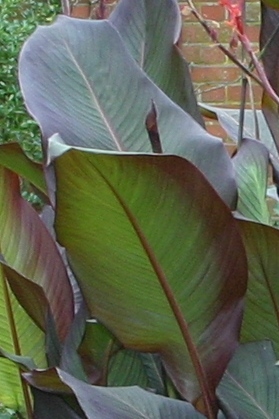 Unusual foliage colour, which is a distinctive shade of bronze. 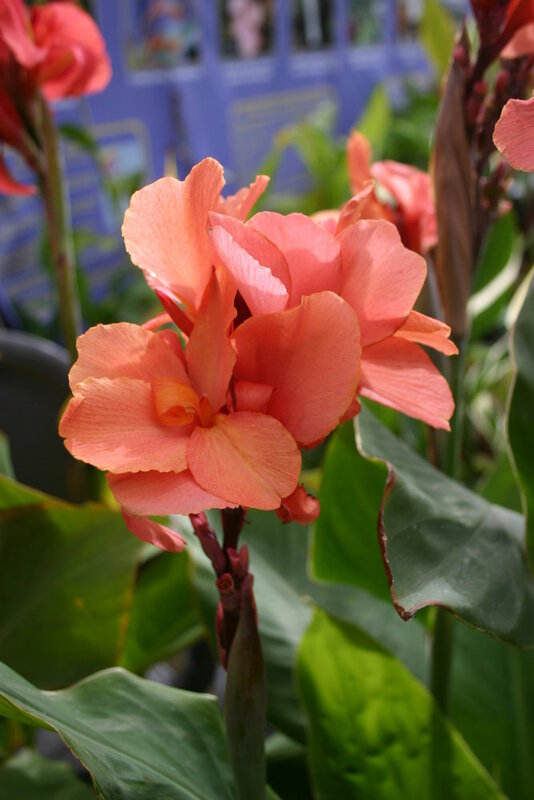 The "HAPPY MISS" Cannas are a range of new varieties that are very short and chunky, and produce lots of flowers. They are happy in a 4 Litre (5") pot, or at the front of the border. 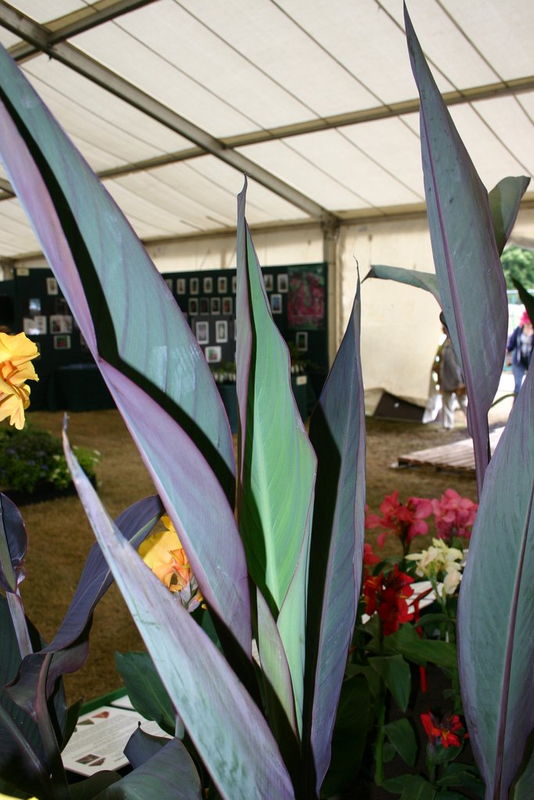 A tall plant with very narrow and very dark foliage. The flowers are very dark red. 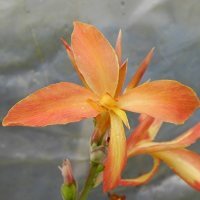 Given to us as an unnamed seedling by a Dutch grower whose name was Herman, hence the name. There is no doubt it is distinctive. 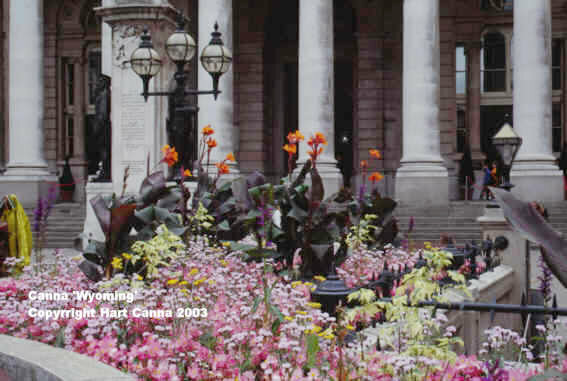 We put it on our stand at the Hampton Court show where sales were very good, so here it is in our catalogue. 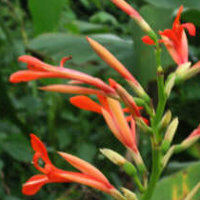 A very tall and vigorous plant with pale green lance-shaped foliage and bright orange flowers. Produces copious amonts of seeds. 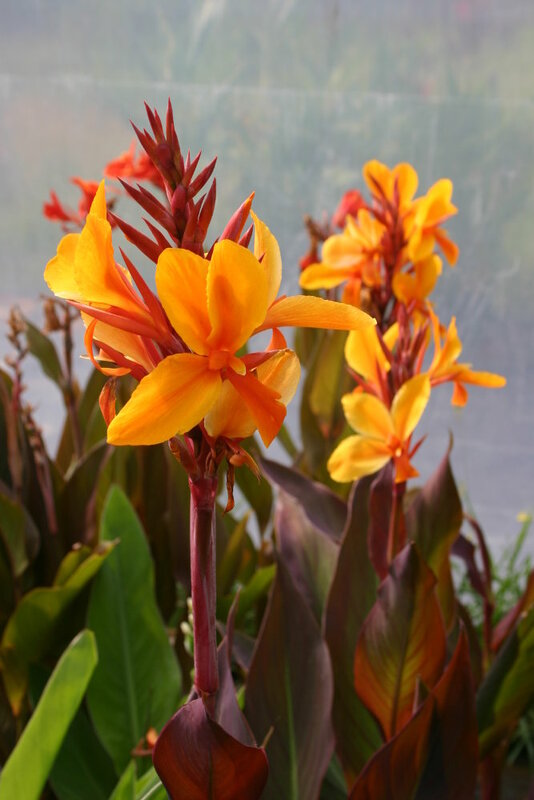 A tall canna with dark brown narrow lanceolate leaves, and rather nice but small orange flowers. 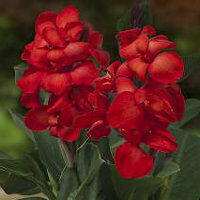 Sometimes confused with 'Mystique', which is exactly the same foliage but with red flowers. RHS AGM Awards 1906 and 2002. The two awards say it all. Flowers large and very pale pink. 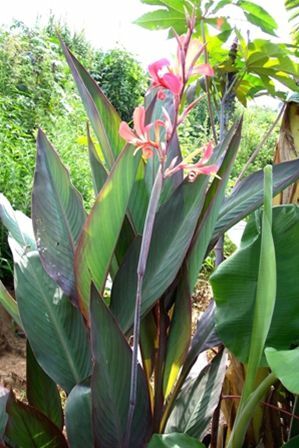 This is usually classed as a foliage variety, because it grows tall, and it has distinctive narrow very dark leaves. 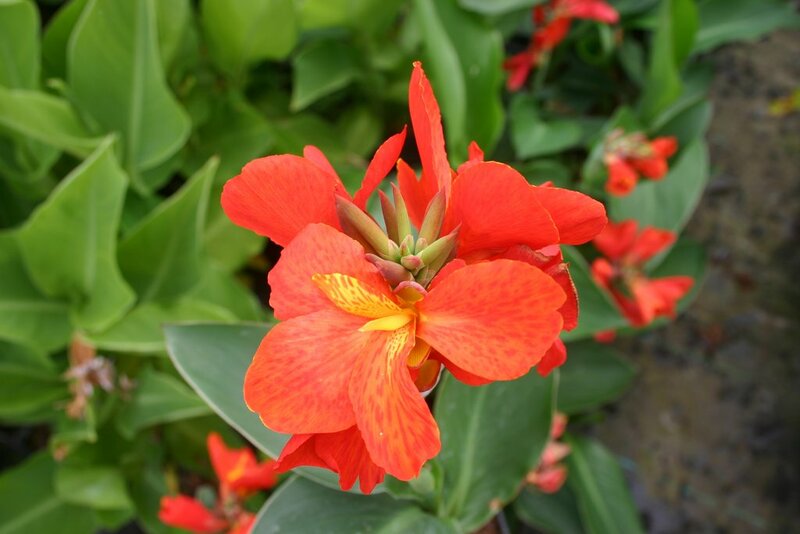 It also has a nice flower, albeit small, so we include it here as a floral variety. A giant variety, over 2 meters. 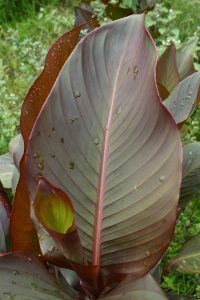 Green leaves with red veins and edges, and red stems. Suitable for the larger garden, National Trust properties etc. 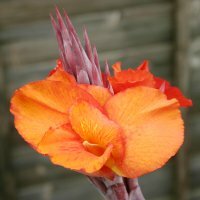 It rarely flowers in the English climate because by the end of summer it has not reached its full height. 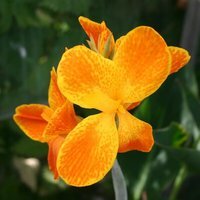 The flowers are small and orange. 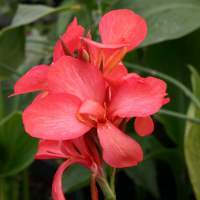 A favourite at RHS Wisley Garden, where it has been featured in floral displays for the past few years. Foliage: Glaucous green narrow leaves. 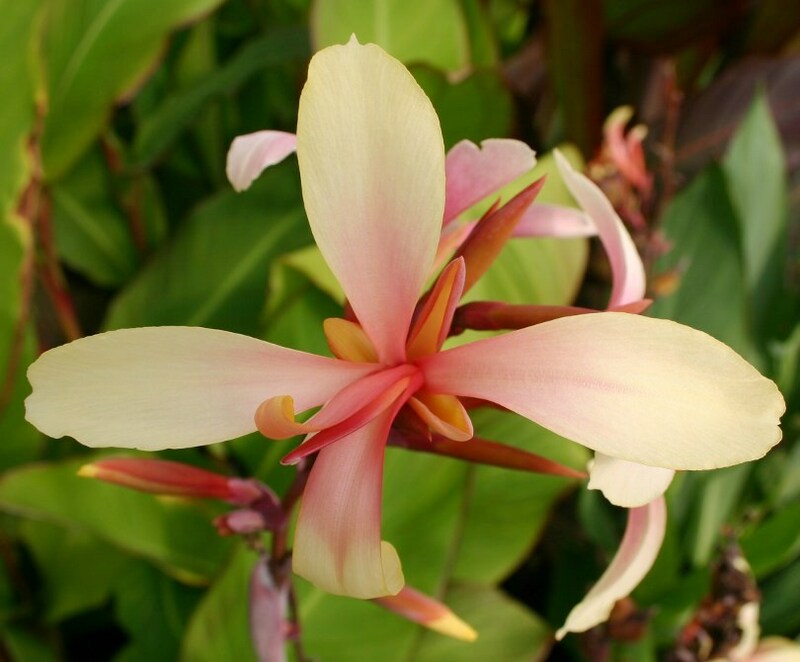 Flower: Cream with a mahogany centre. 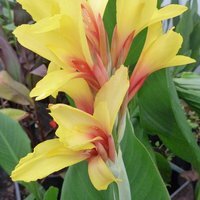 Quite unlike any other canna. Most people love it at first sight. 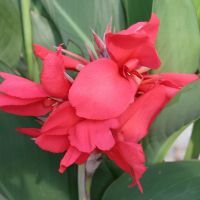 A sturdy plant of medium height, with fleshy pale green foliage and large scarlet flowers. Much beloved of London parks in years gone by. RHS AGM Award 2002. 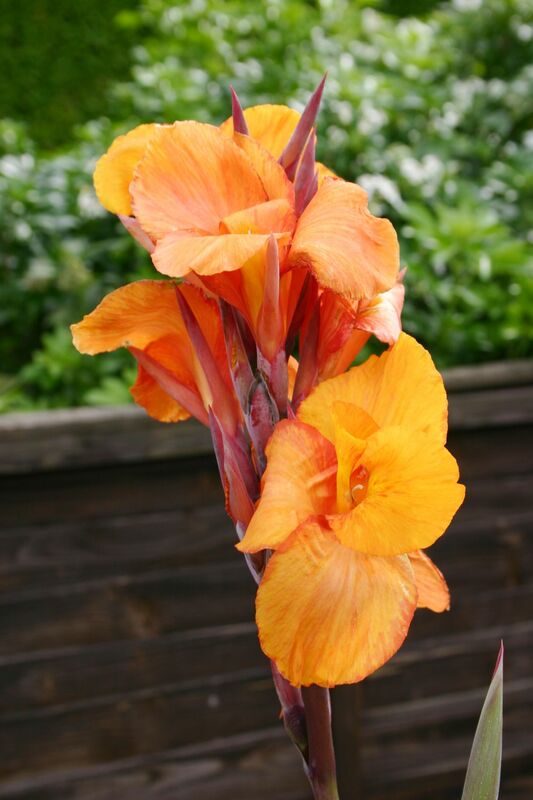 An exceptionally popular variety. 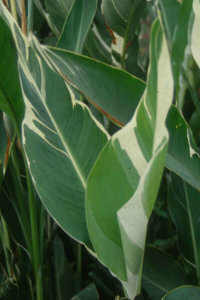 The unique feature is the foliage, which is herringbone stripes, cream on green. 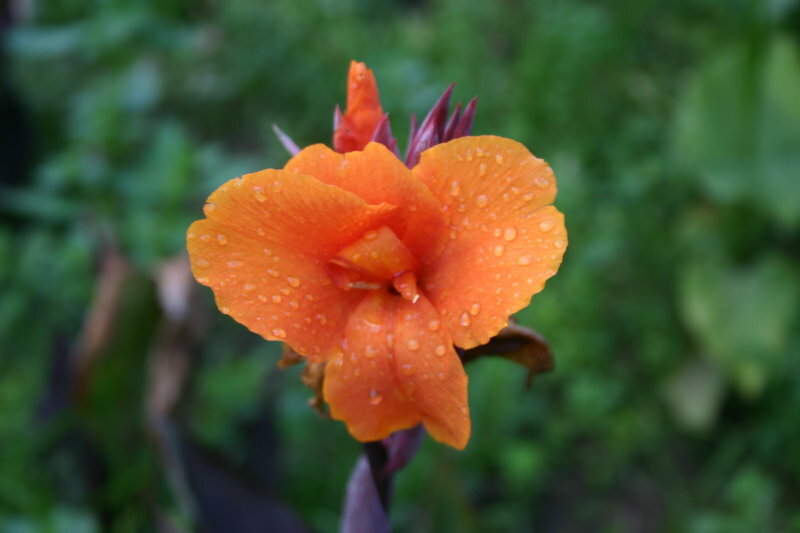 It has exactly the same large orange flower as 'Durban (to which it is genetically related). 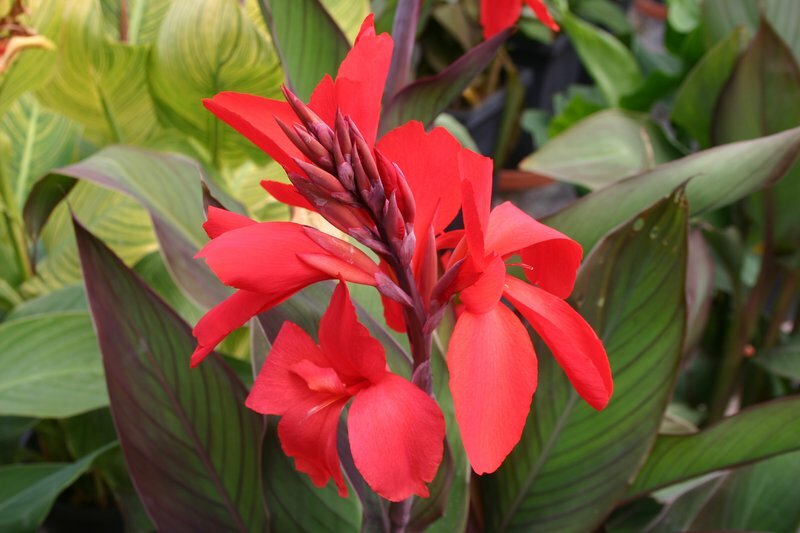 This is one of the best canna varieties, and one of the 'classics' of the canna world. It never fails to please. 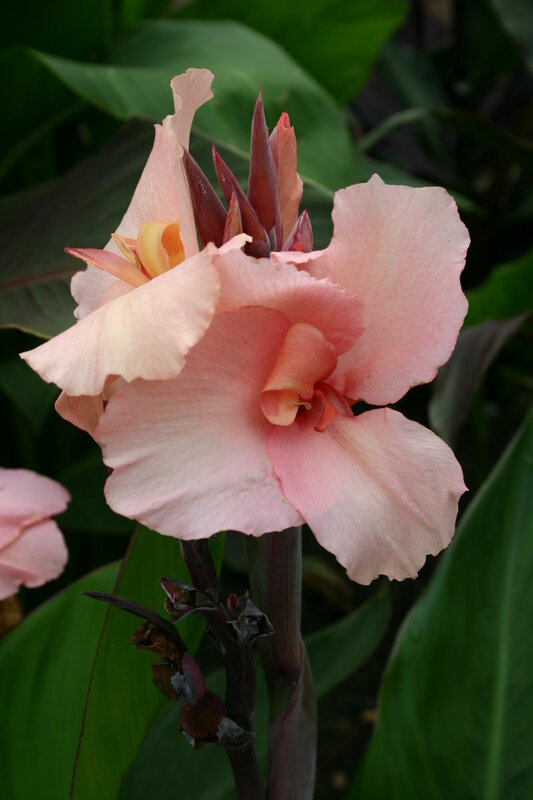 A delightful canna with well-shaped pale pink flowers with a touch of yellow. Bred in 1922 in France. 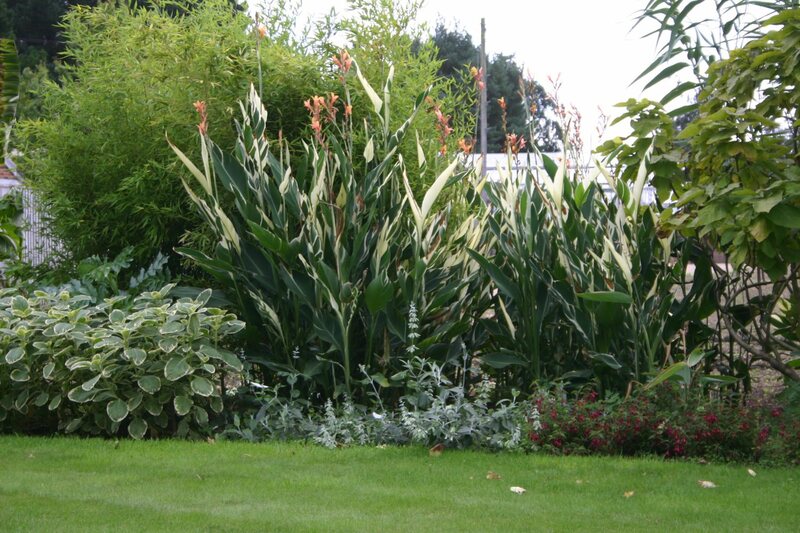 A giant variety, over 2 mtrs, with bronze foliage. Upright (fastigiate) growth. 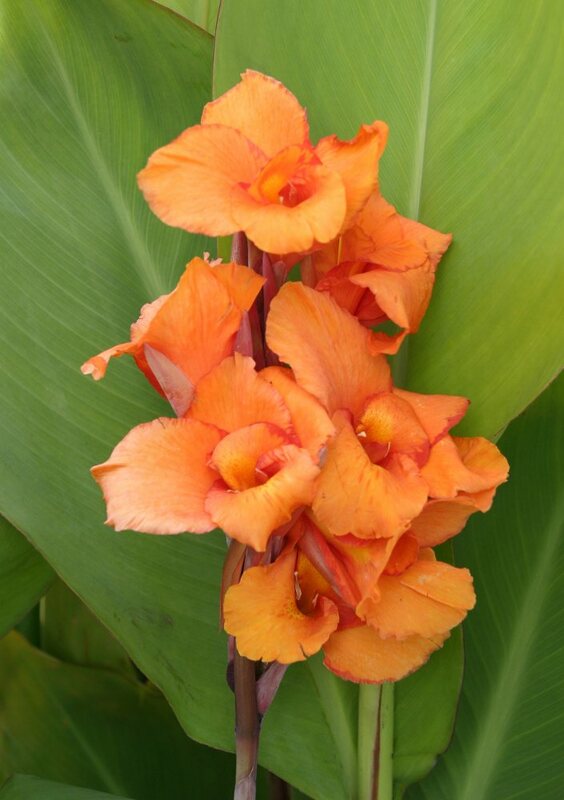 Small orange flowers. 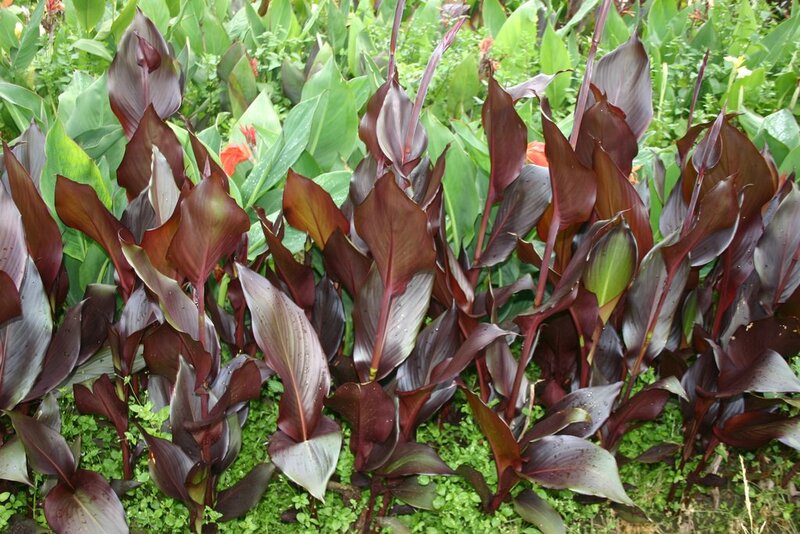 We stock 'Purpurea', but we feel that 'Russion Red' is an improved version and is better. We stock them both. It is the customer's choice. 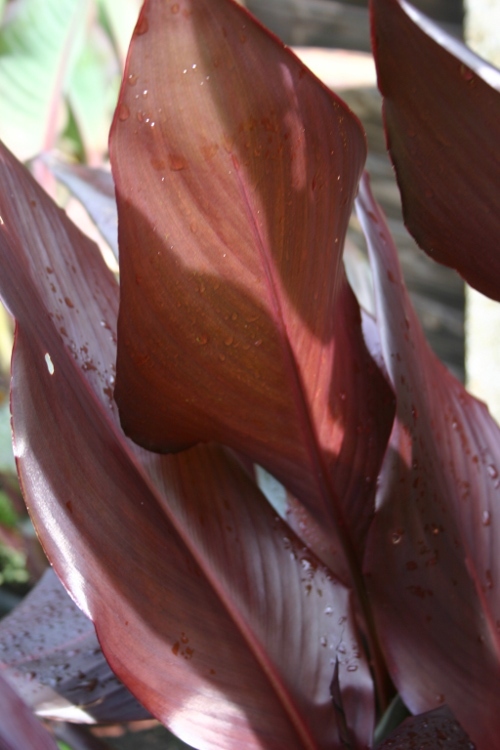 'Russian Red' has bigger and darker leaves, and is not so narrow in growth. 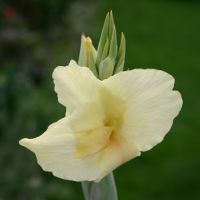 An old variety, bred in Germany. 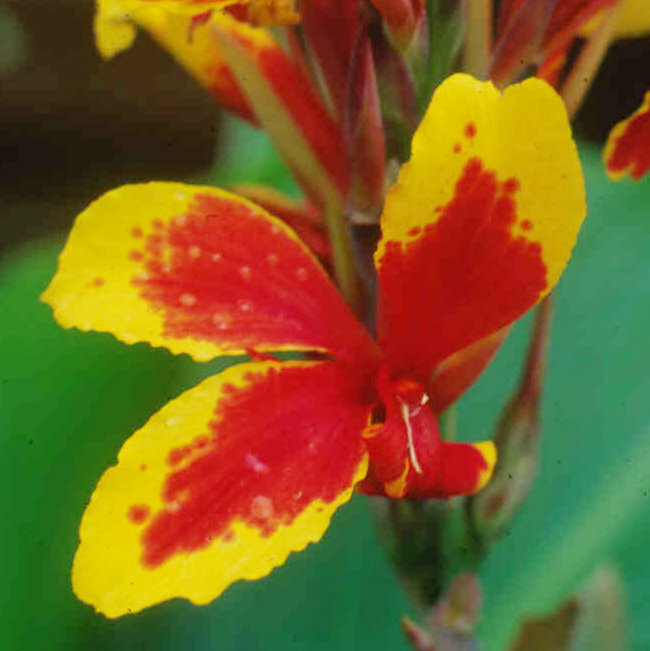 An extremely vigorous canna which produces masses of new shoots each year. 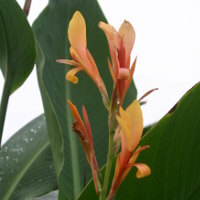 A species-type canna with rather small orange flowers and bright green foliage. Medium height and very vigorous. 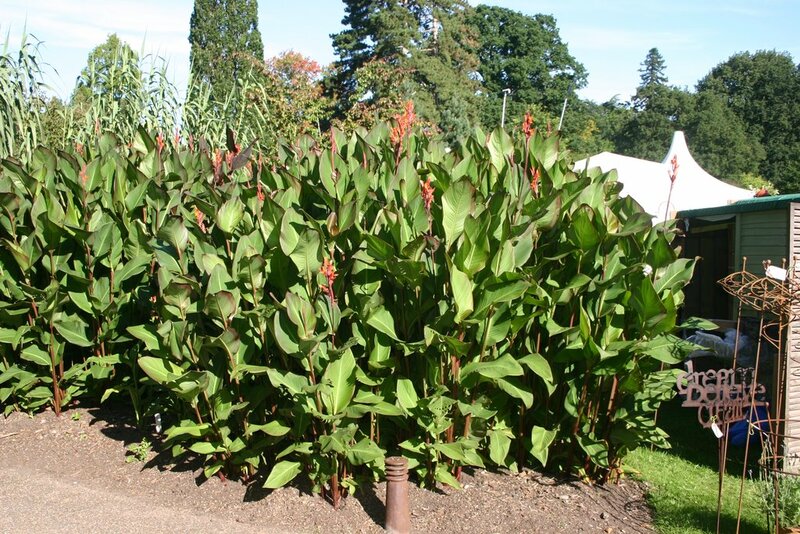 An impressive plant for the herbaceous border. 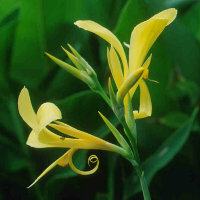 The flowers remain somewhat funnel-shaped. Flower: Bicolour red and yellow. 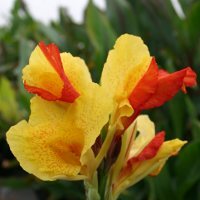 An "Italian Series" canna bred around 1900. 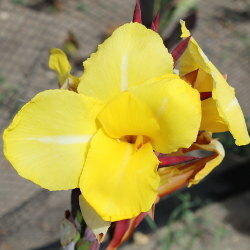 There are several similar varieties, and we are not exactly sure of the name, particulatly since the patterning can be variable - some flower have more yellow, and some less. If anyone has an opinion on this please let us know. 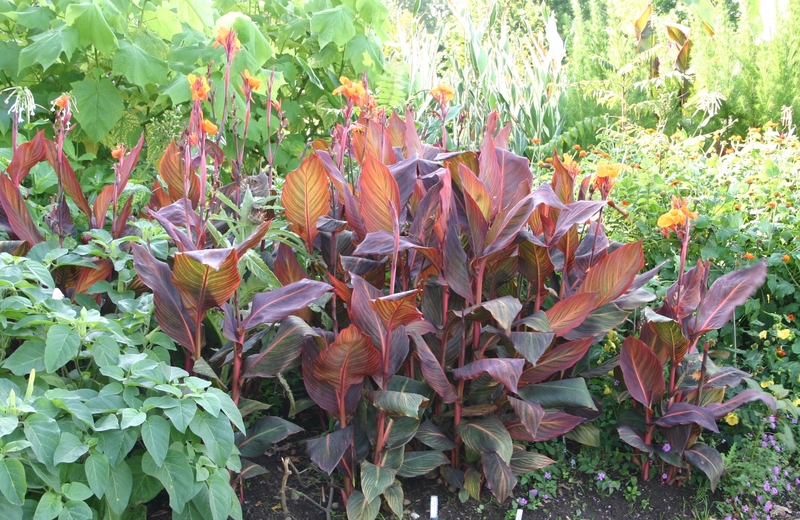 A giant variety, 2 mtrs+, with very dark reddish bronze foliage. 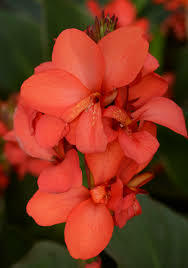 Small orange flowers. Suitable for the larger garden, National Trust properties etc. 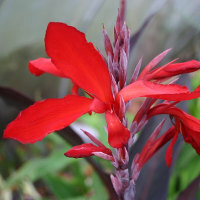 We identified this variety as an improved version of C. indica 'Purpurea' (it has bigger and darker leaves) which we named 'Russian Red' (don't ask why, it's a long story). Very large apple-shaped rhizomes. 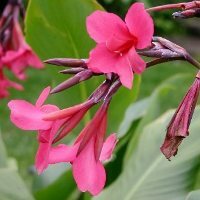 We believe one of the varieties used for food. We've tried it, but not to our taste. 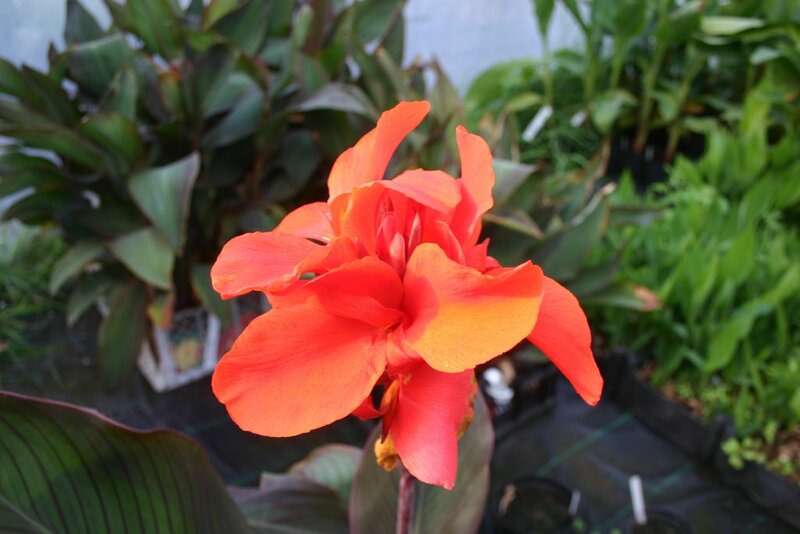 We submitted it to the 2002 RHS Canna Trial where it received the RHS AGM Award. 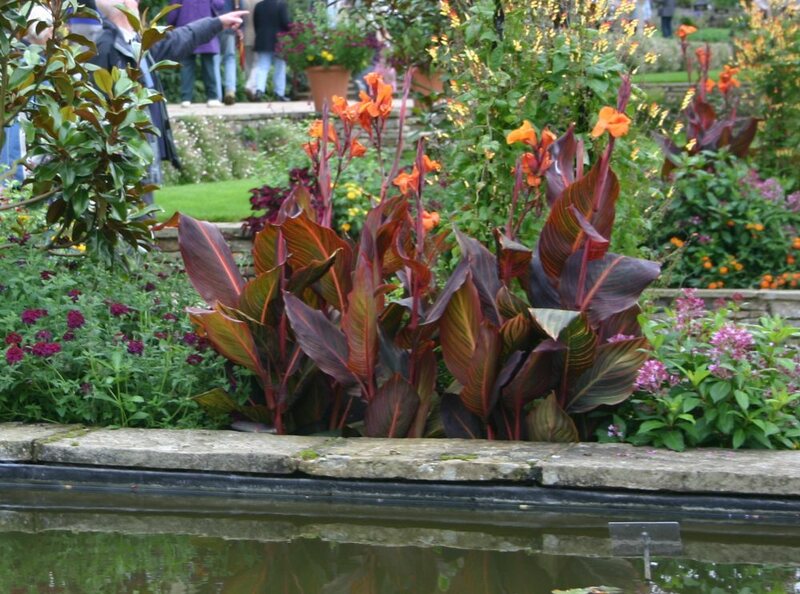 'Purpurea' was submitted to the same trial by the RHS itself, and failed to win an award. Nuff said! 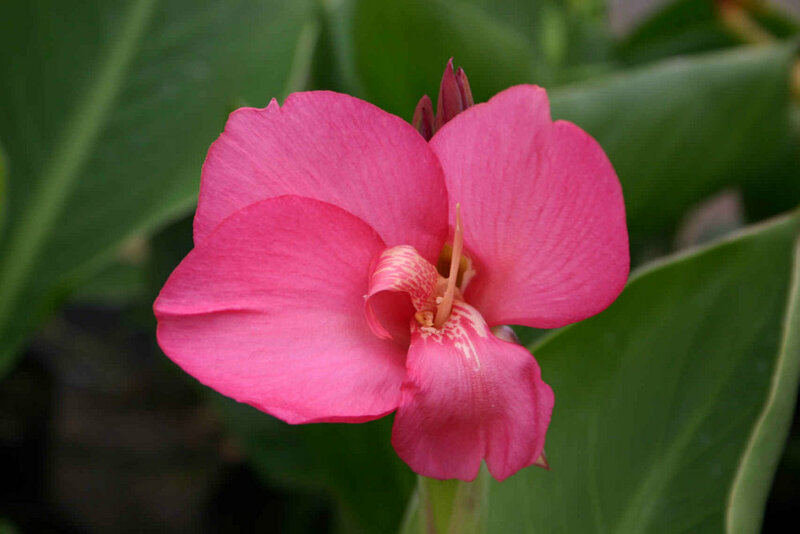 Flower: Pink with silver sheen. RHS AGM Award 2002. 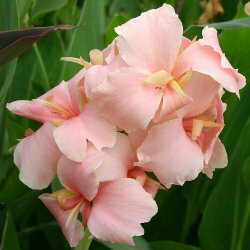 This is an old variety, and one of the most spectacular of the pink varieties. 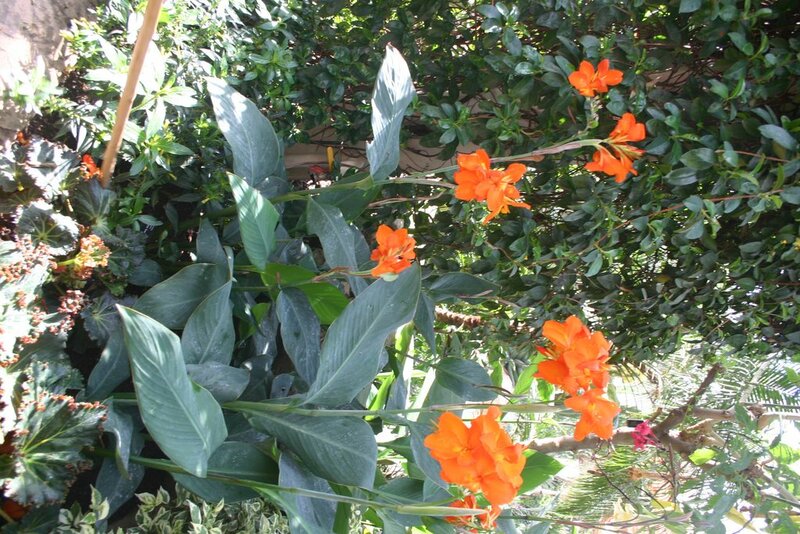 Large bright orange flowers, and a tall, bright green plant. RHS AGM Award 2002. An old variety with a new name and an interesting history. 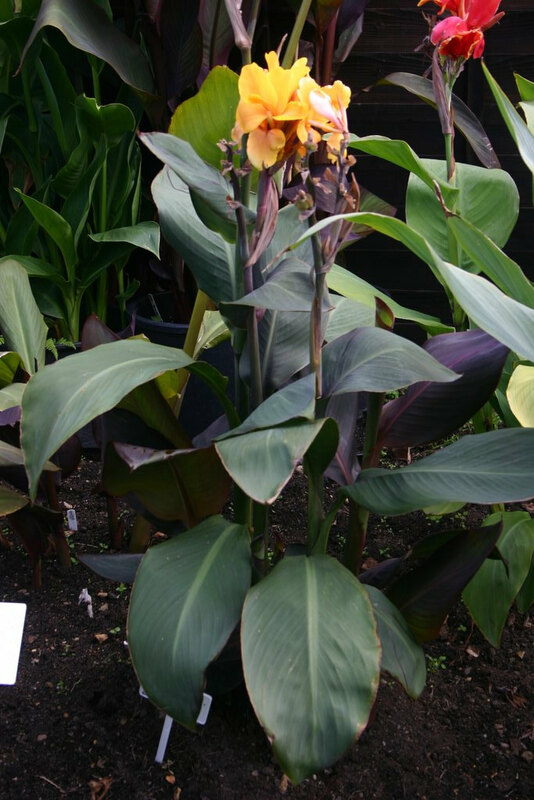 In 2002 RHS Wisley submitted a distinct but un-named cultivar to the canna trial. 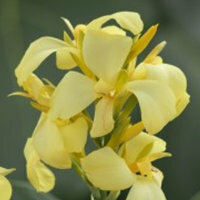 It was a variety widely grown and even naturalised in the wilder parts of the garden. It had no variety name so they simply called it C. indica cultivar. Within the year of the trial, the 3 rhizomes that they planted grew into an enormous clump, and so impressed the judges that they awarded it the coveted AGM Award. 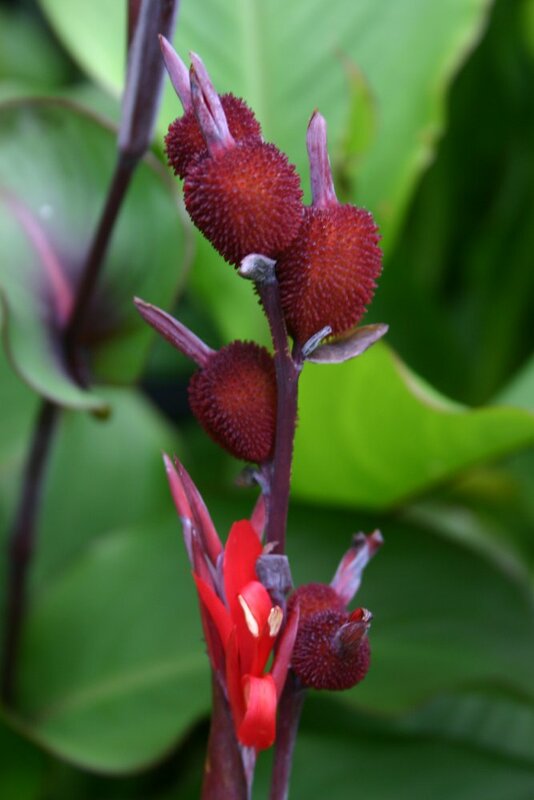 This variety then retreated into obscurity, but continued to be grown as a naturalised plant in the RHS garden. Pan forward to 2013. 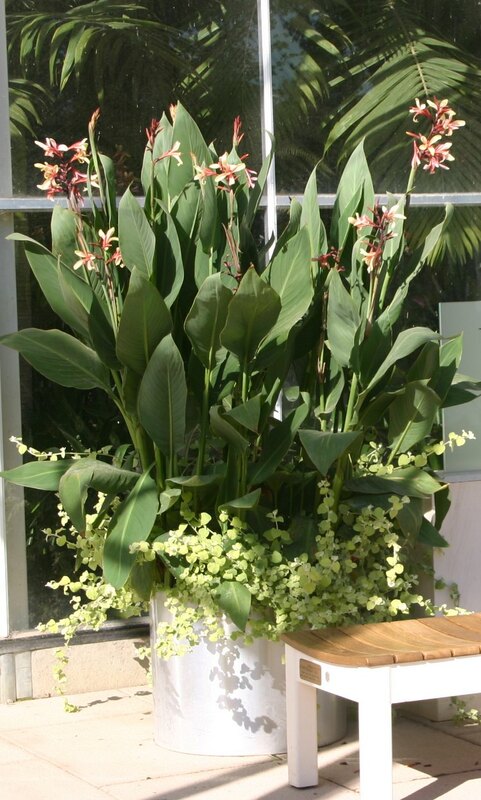 We had acquired specimens of this plant from the RHS, and we felt that it deserved to be marketed commercially. 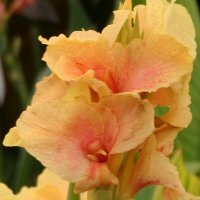 So we approached the RHS and suggested that a plant with the AGM award should be given a variety name. The RHS duly gave it the variety name 'Society Belle'. 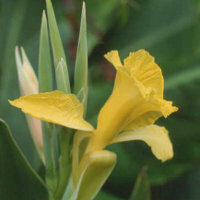 It is a tall variety, around 2m, with green foliage lightly tinged bronze. 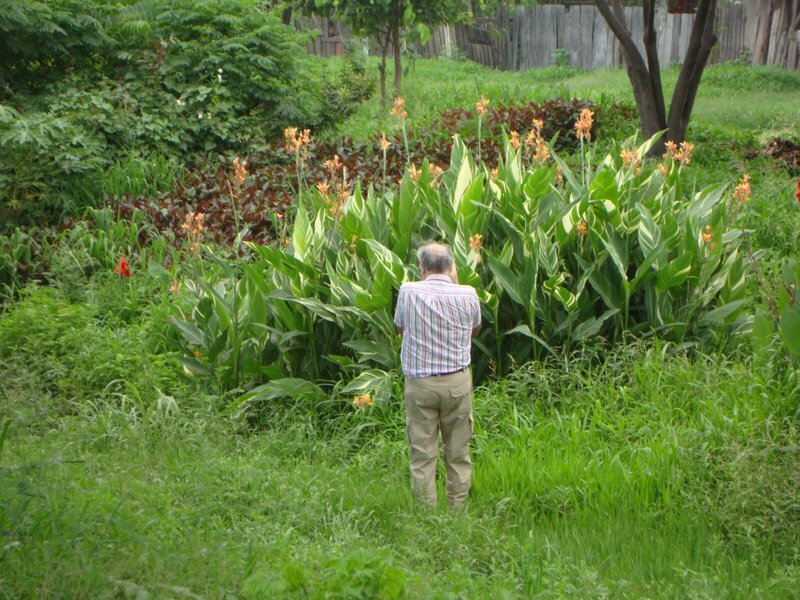 It is very prolific, and is seemingly relatively hardy . 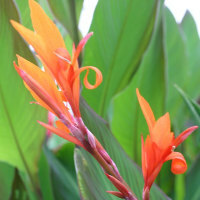 It has small orange species-type flowers. 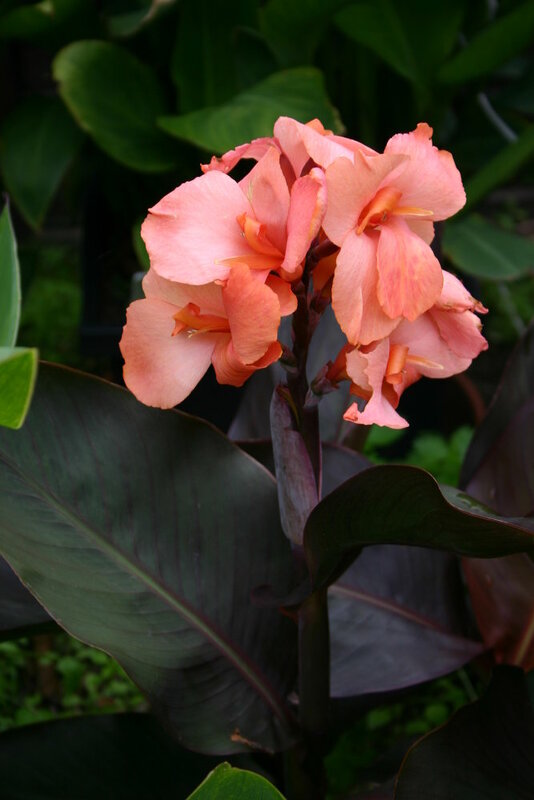 It is distinct from 'Musifolia Grande' (ie it is not reminiscent of a banana plant), and distinct from 'Purpurea' (not so dark). 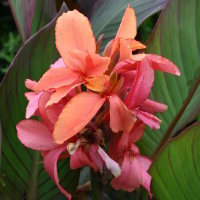 'South Pacific' is a range of cannas bred by Takii of Japan. 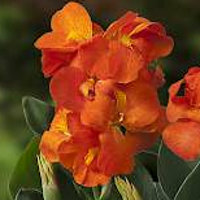 Three new varieties are introduced for 2019: Ivory, Orange, Rose. 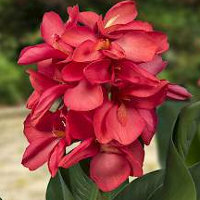 The original South Pacific is now called South Pacific Scarlet. 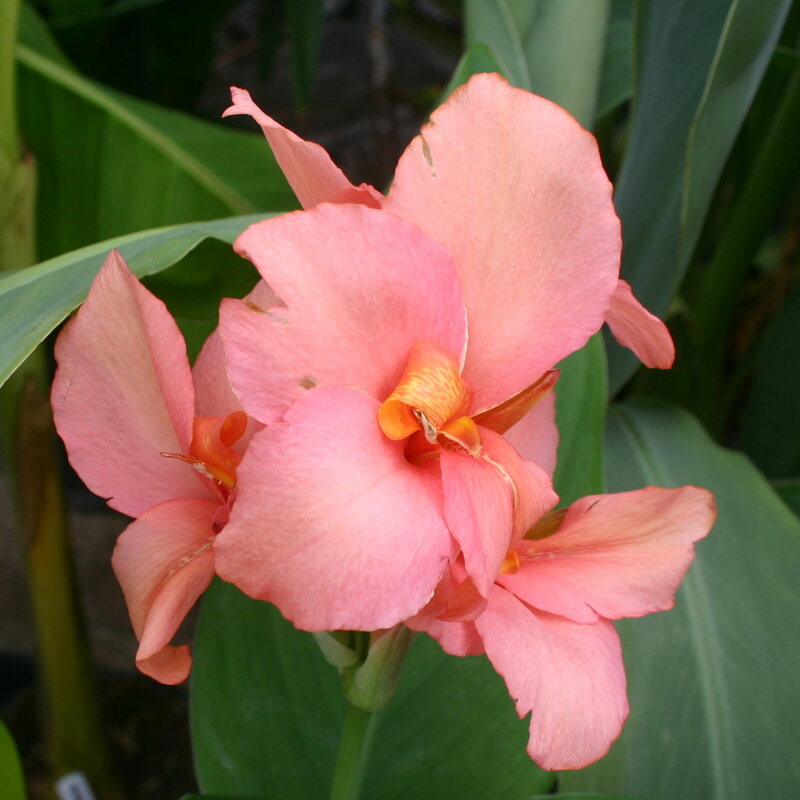 We were very pleased with the original 'South Pacific', and so we have great hopes for these new varieties. Scarlet and Orange have received AAS Awards. 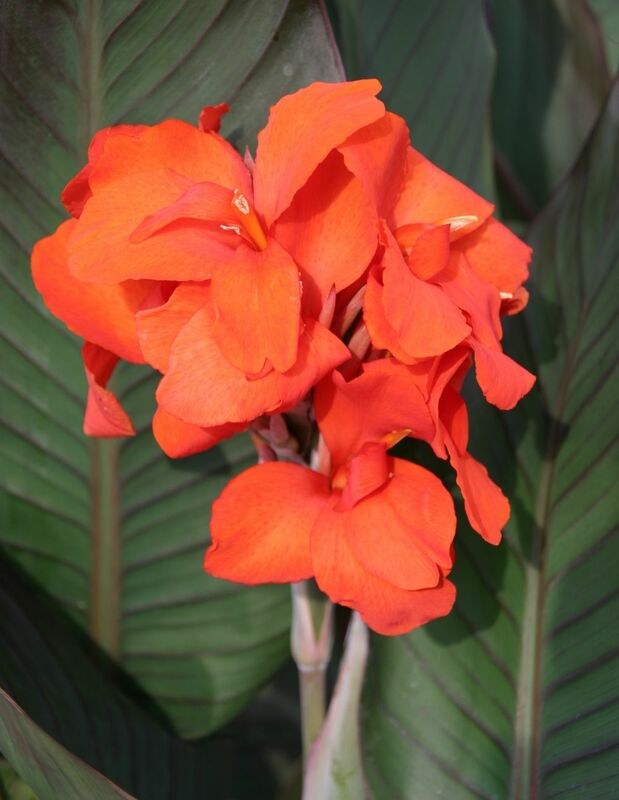 These cannas are produced from F1 seed, and flower 90 to 120 days from sowing the seed. 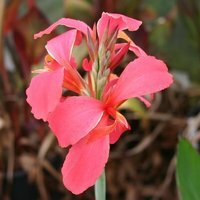 What we sell are from seed sown earlier in the year, which should be in flower this summer. 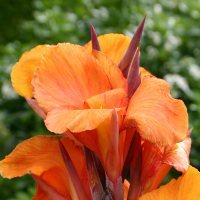 When received, they should be potted-up using good quality compost to which a little general purpose fertiliser has been added. 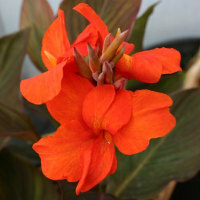 They can remain in 5 ltr pots for the remainder of the year, or planted in the flower border. They will multiply and can be divided for future years. 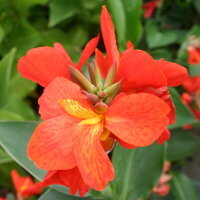 Flower: Orange-red with a touch of yellow in the centre. 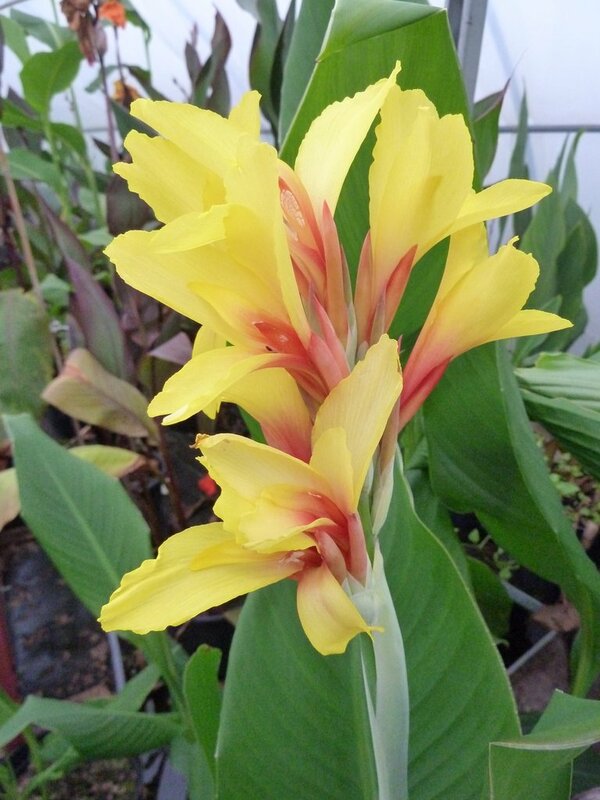 A very unusual and distinctive canna. 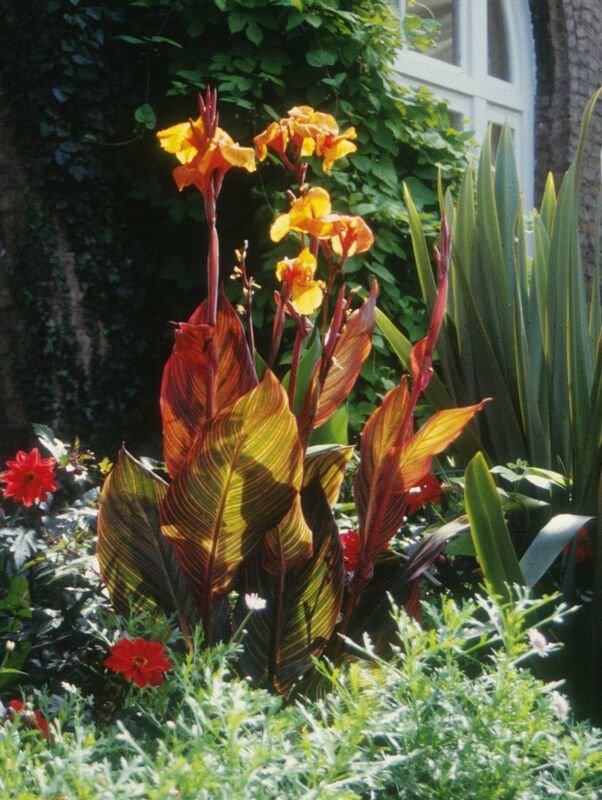 One of the tallest cannas, 2.5 meters, with narrow glaucous leaves variously striped and splashed with cream. Smallish apricot flowers. 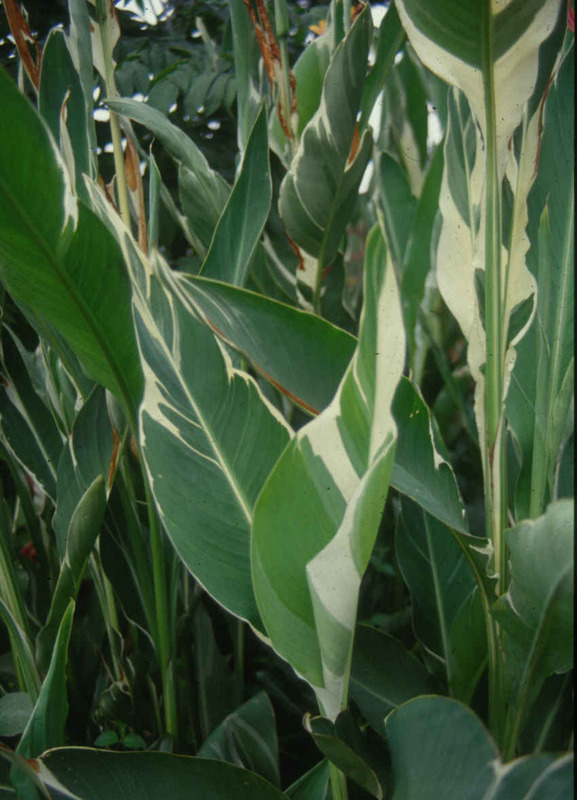 The foliage always becomes disfigured by some cream areas turning brown, and there seems to be no way of preventing this. Certainly, growing them in the shade doesn't work and neither does high-potash fertiliser which is sometimes recommended. But even so, it is so vigorous that this minor fault may be overlooked. 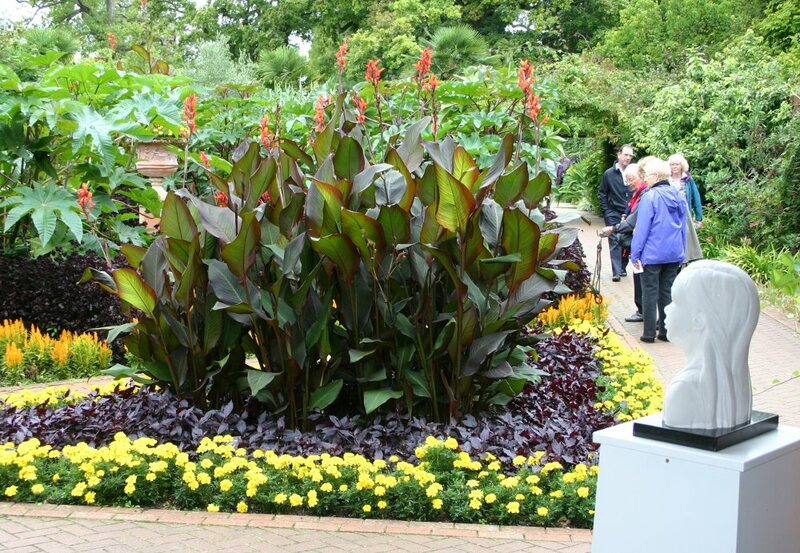 It is very popular at Wisley Garden. 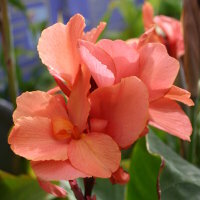 A short plant with distinctive orange flowers. 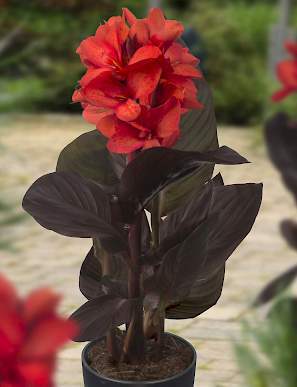 A medium tall canna with dark bronze foliage and large red. The first of the Takii 'Tropical' series. This is a range of 6 varieties bred by Takii in Japan. All are very short (but not as short as the "Happy" series, which see). Fowering at around 0.3 meters to 0.5 meters (12" to 18"). 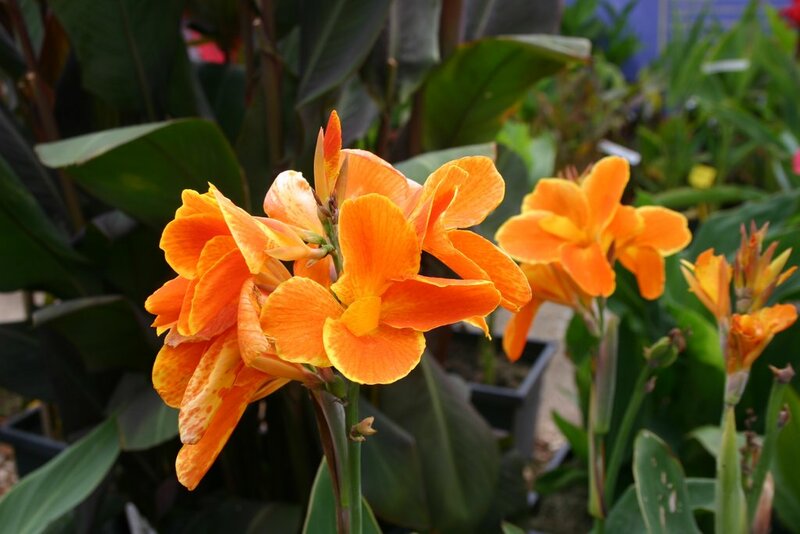 They are suitable as border edging plants, and they can also be grown as pot plants in quite small pots. 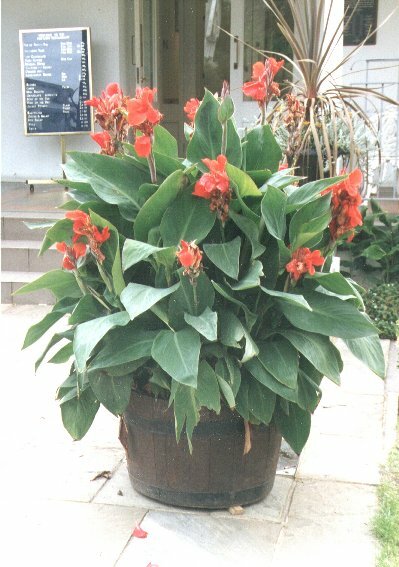 We recommend a 5 Litre pot (about 8") per plant. 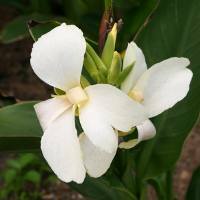 There are not many white cannas and this is the only one that is short. It is also a good shade of white. Now out of stock . 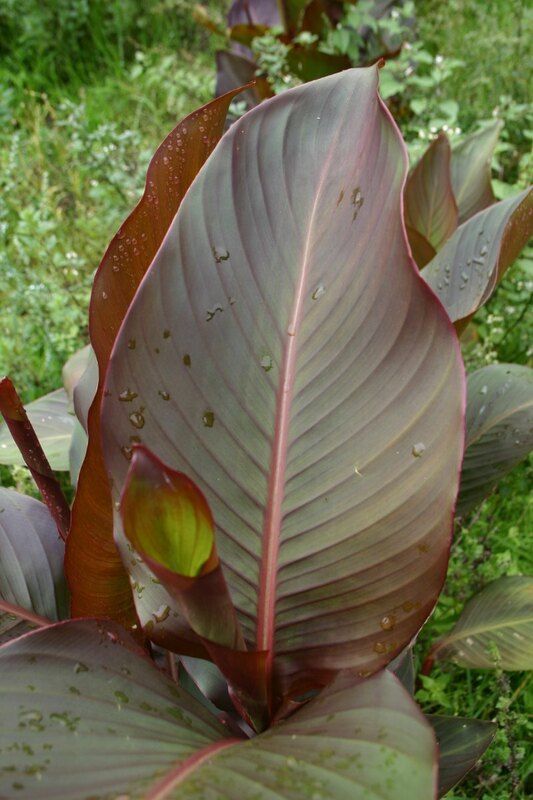 Foliage: Green with a bronze blush with distinctive red stem and leaf veins. 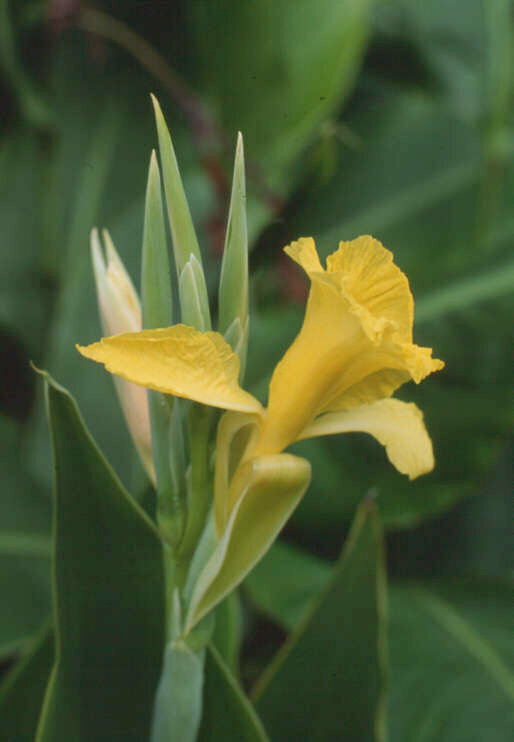 The photo below is of a single plant and was taken at the 2002 RHS Canna Trial. 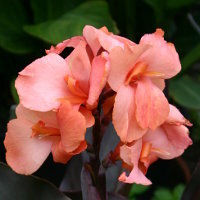 An old variety which is one of the all-time favourites. 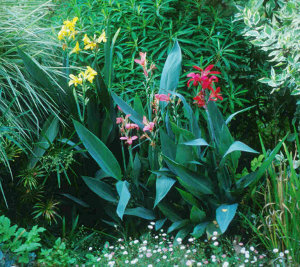 This is a range of 4 varieties which are intended to be grown as water plants. They grow with the roots and crown totally immersed in water, but they can be grown equally well in the garden border, and seem just as drought-hardy as other cannas. They are all tall plants (2 metres). 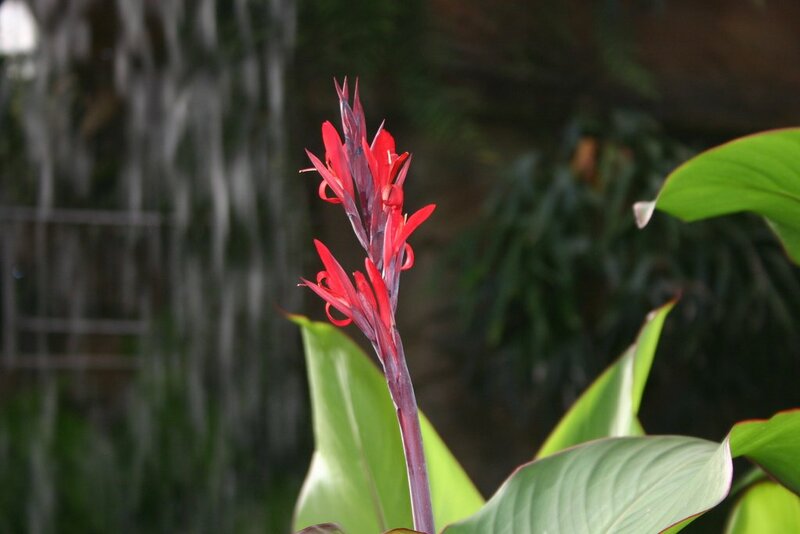 They were bred in America (at Longwood Gardens, Pennsylvania) from C. glauca which is always found in shallow water. Like C. glauca, they all have narrow lance shaped glaucous (bluish) foliage, and attractive rather spidery flowers. There are 4 varieies: 'Ra' (yellow), 'Erebus' (pink), 'Endeavour' (red), 'Taney' (orange). All are named after ships (Erebus and Taney are American warships). 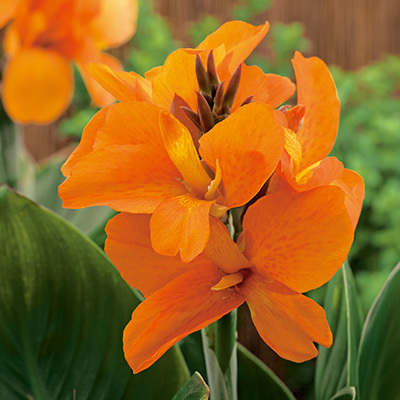 'Ra' is the most popular, followed by 'Erebus', and both were awarded AGM at the 2002 Wisley Canna Trial. We served on the Trials Committee (status Technical advisors as owners of the UK National Collection). 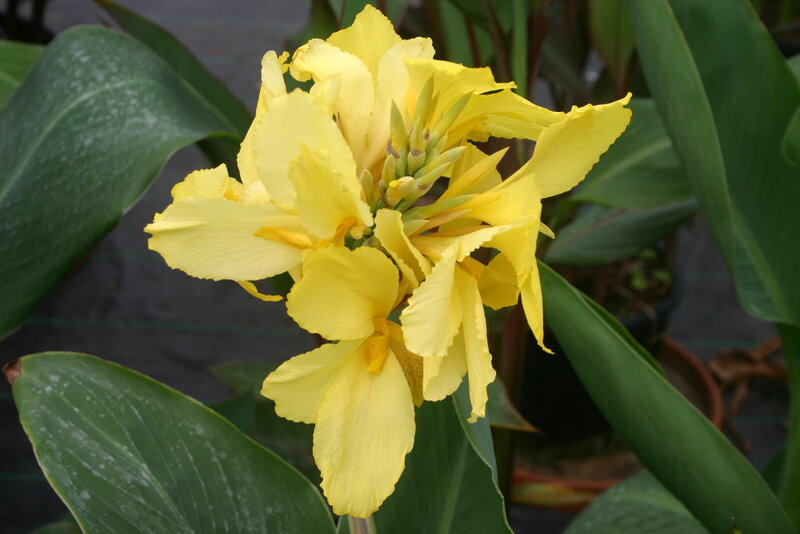 'Ra' was very popular with the Committee and was awarded AGM ststus as soon as the first flower opened. 'Erebus somewhat later. In our opinion 'Endeavour' should also have been awarded AGM. 'Taney' is not very good (though beauty is in the eye of the beholder). 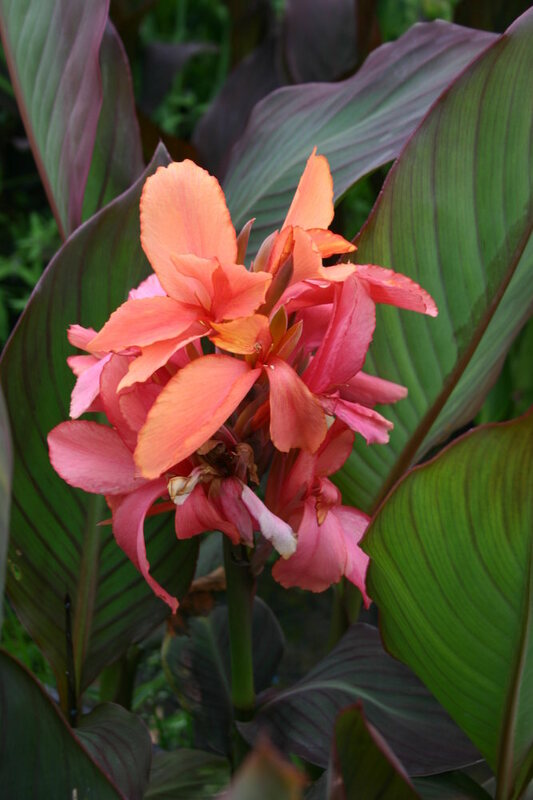 In the Britich climate, Water Cannas usually die if left in the outdoor pond over winter. 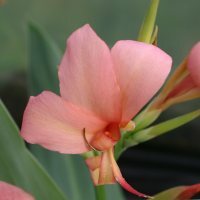 The rhizomes are very slender and often die during the winter even in glasshouses if allowed to go dormant. 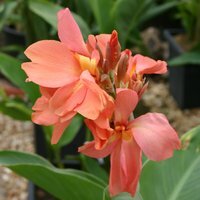 For this reason we recommend taking them out of the water and growing them through the winter as plants in a frost-free greenhouse. They are happy not standing in water. 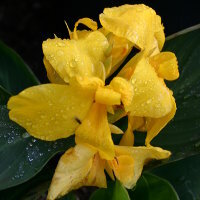 Occasionally other canna varieties varieties are encountered with the prefix "Water Canna". These are imposters or wrongly named. 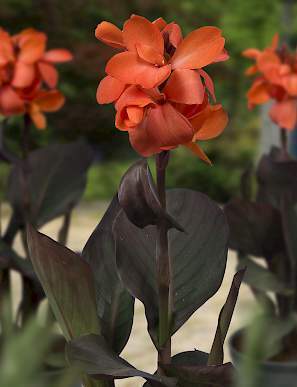 In our opinion "Water Canna" refers to these four varieties bred at Longwood Gardens. 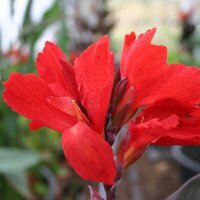 If anyone has canna species that we don't have we would be grateful if they would get in touch with us. 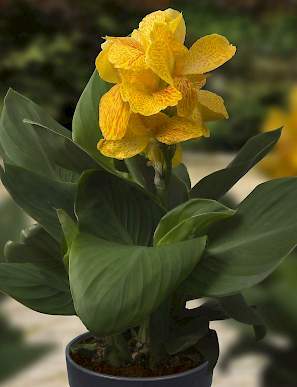 Soft pale green foliage and large flaccid yellow flowers the texture of tissue paper. Enormous seed pods. Medium height. 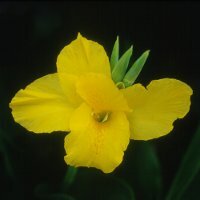 Night flowering, and reputedly fragrant, though we find the scent difficult to detect. 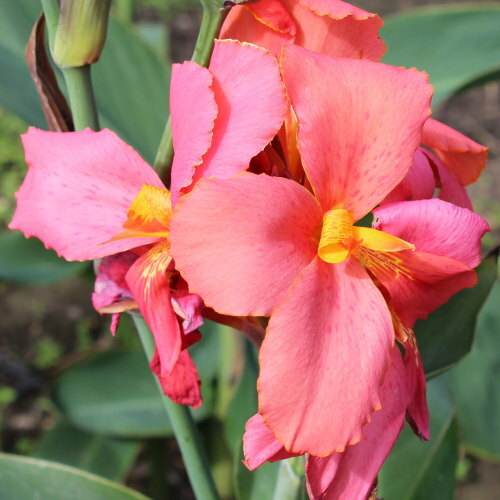 Believed to be in the parentage of many floral varieties. It is native to the Florida Everglades whete it is known as "Bandana of the Everglades". On of our contacts says you usually find it where yoyu find alligators. 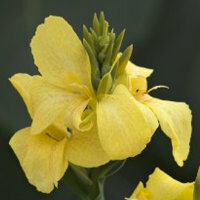 It normally grows in shallow water although it will grow equally well in the garden border. A collectors item, we find it needs hot conditions to flower. 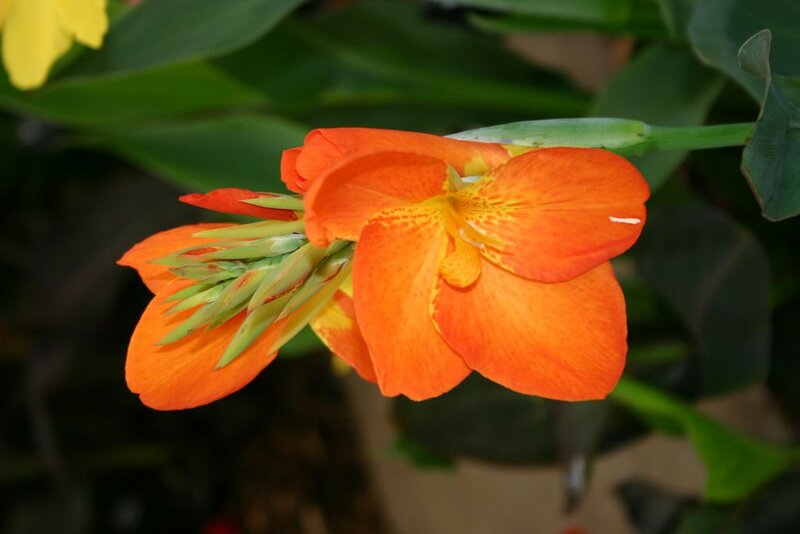 It performs better in a greenhouse than outdoors where the buds often turn to mildew. 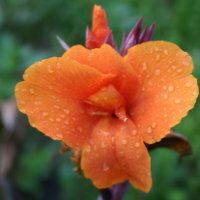 It is night flowering and pollinated by moths. Each flower lasts barely more than a day. Very narrow reed-like foliage of a glaucous (blueish) hue. 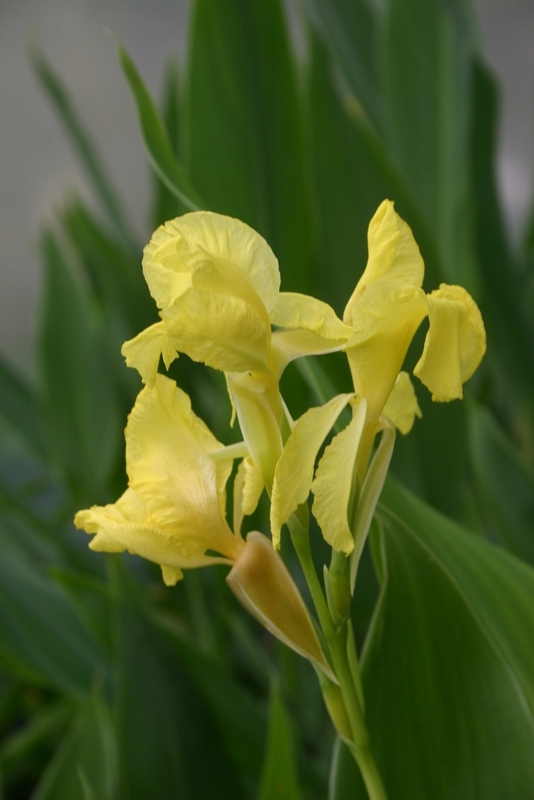 Fairly large pale yellow spidery but attractive flowers. 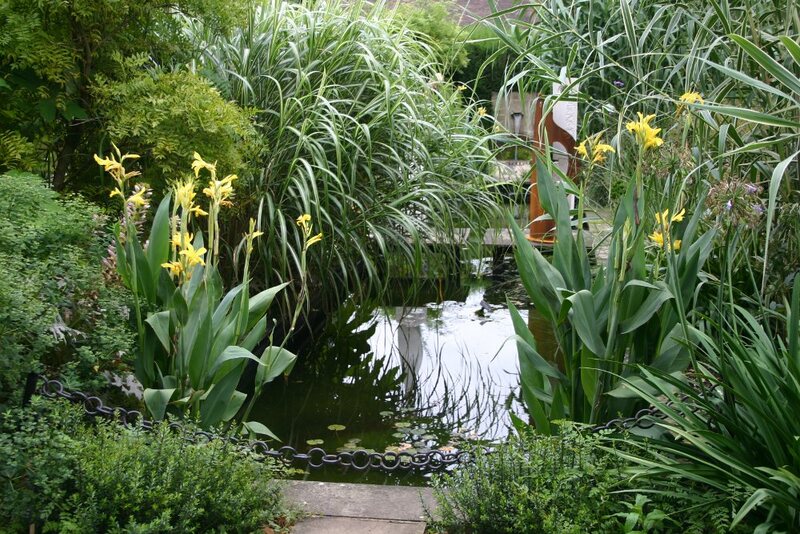 A deservedly popular garden plant which can be grown in the pond. 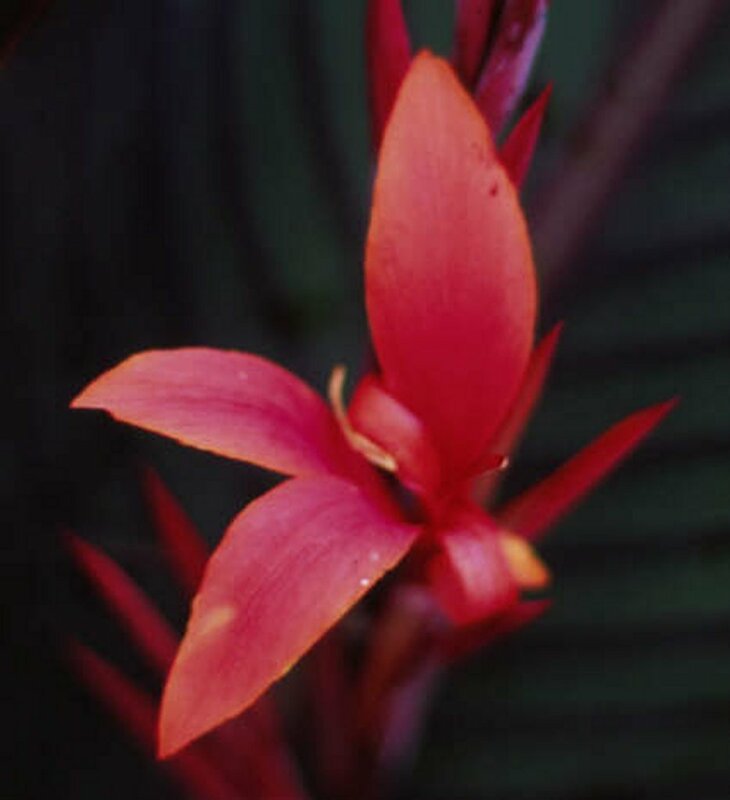 Natively found growing in shallow water throughout the tropical Americas, from the southern USA to Chile and Argentina, and in the West Indies. 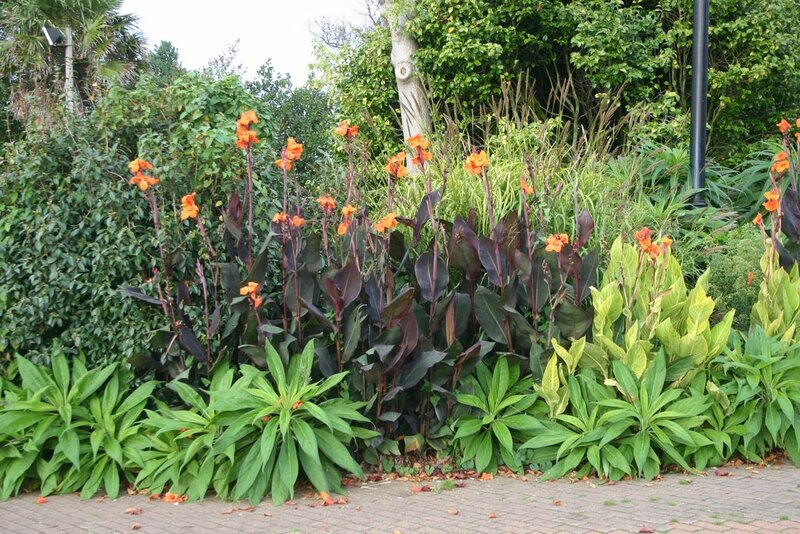 It will grow equally well in the garden border. 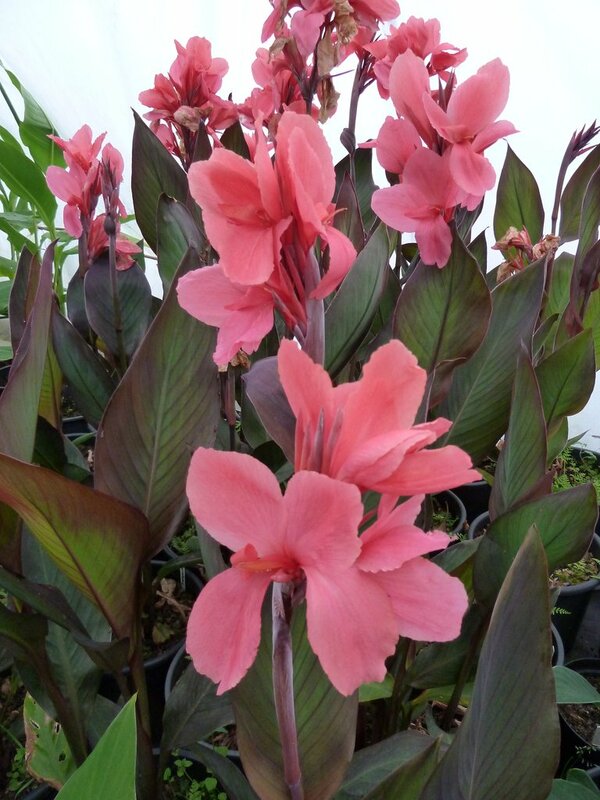 This species is the parent of the "Water Cannas"
Height short to medium. Foliage bright green. 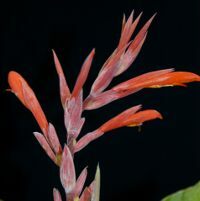 A tiny flowered subspecies of C. indica. 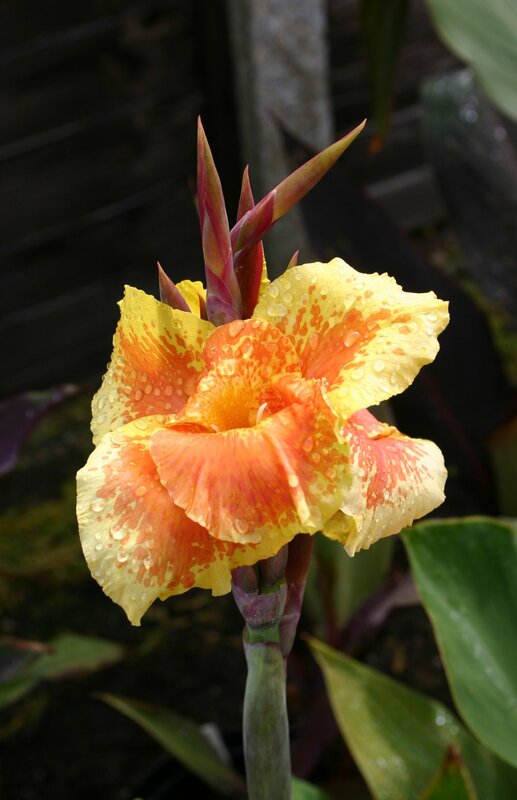 The flowers are yellow with red speckles particularly on the labellum. 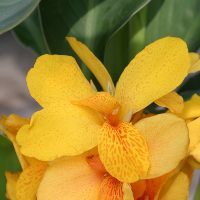 The flowers are carried high over the foliage. Discovered in Argentina as recently as 1988. 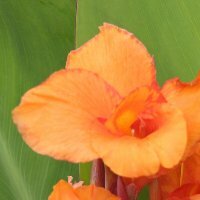 A fairly tall canna with orange flowers which remain almost closed. 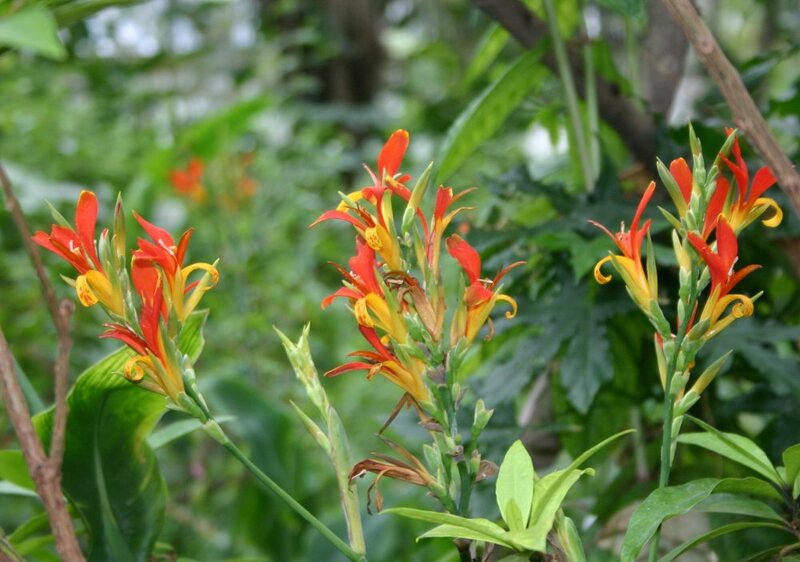 The species name jacobiniflora means the flowers are hooded like a Jacobin monk's hood. 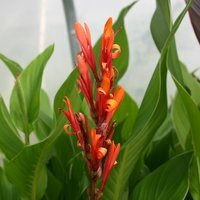 A tall plant with green foliage and small but distinctive orange flowers. 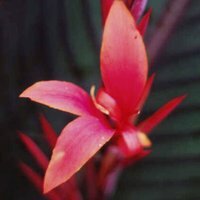 Native to various islands in the West Indies. 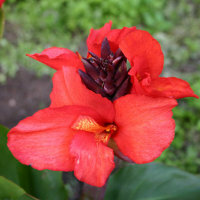 Rather more tender than other cannas. 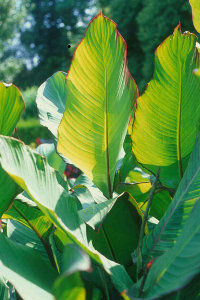 Tall plant with green paddle-shaped foliage. 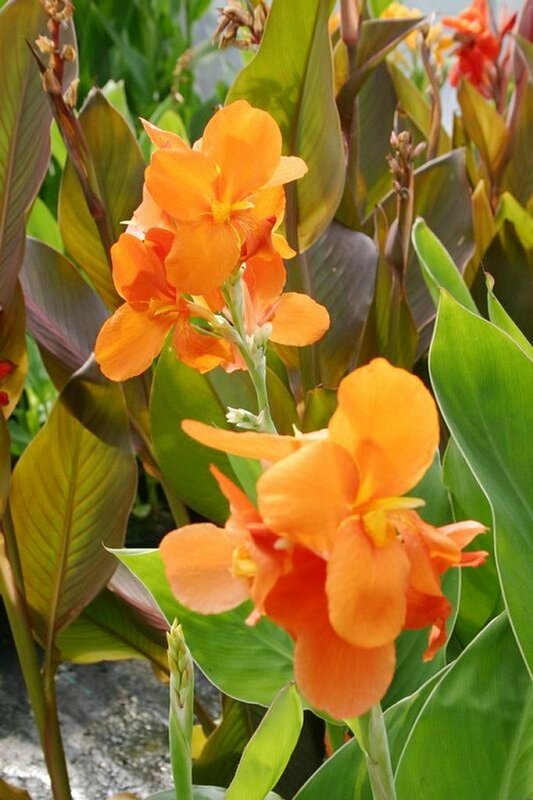 We find it rather more tender than other cannas. 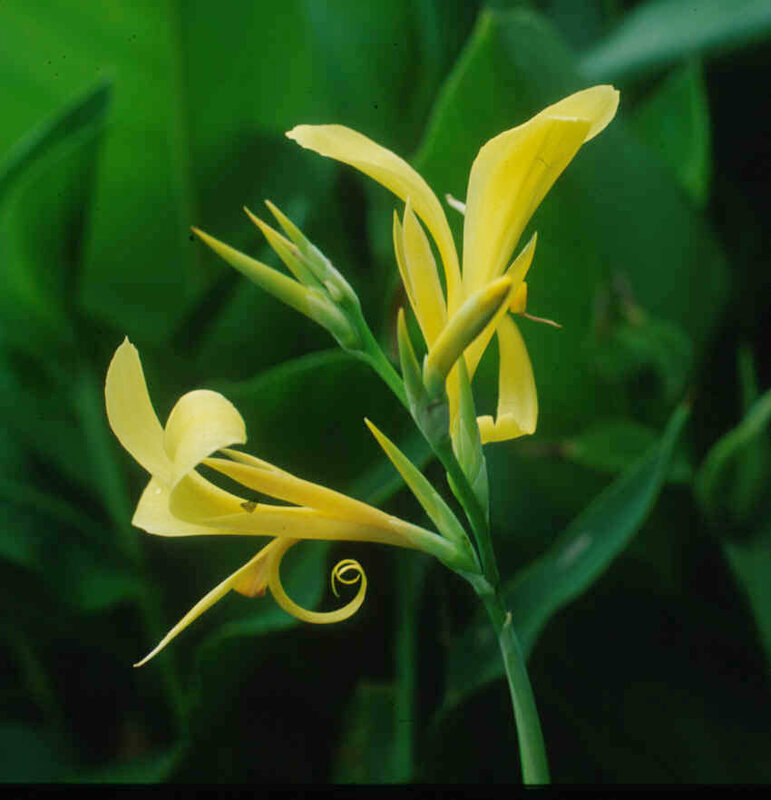 A small wiry plant with small green leaves and rather slender stems. Very floriferous. 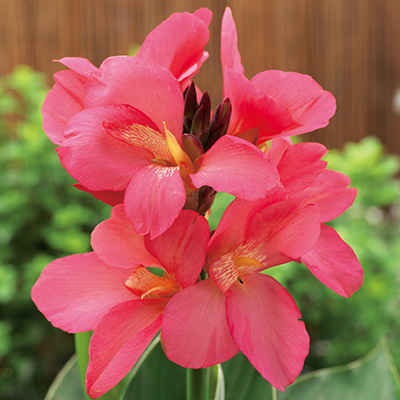 Attractive bi-coloured flowers. 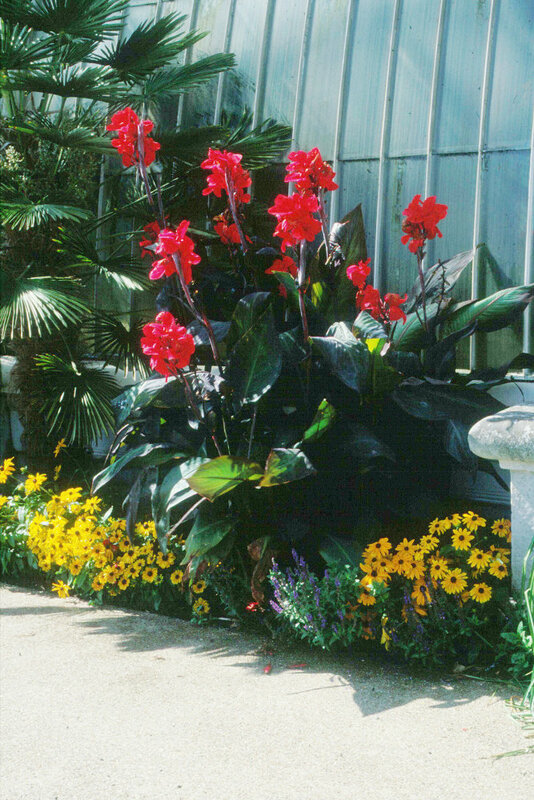 A large clump has grown in the Temperate House at RBG Kew for many years. 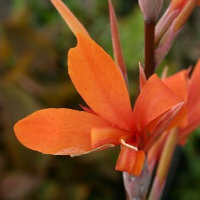 Sometimes seen as C. braziliensis. 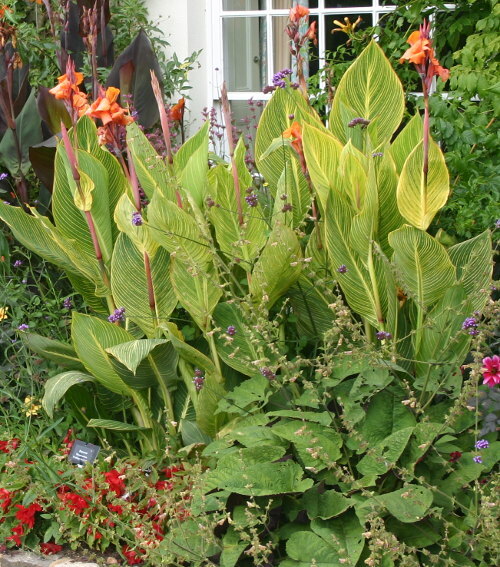 Very big pale green plant with giant leaves and tubular orange flowers. Makes a good foliage plant. 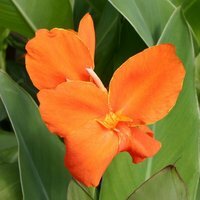 We find it rather more tender than other cannas. Our stock came from Belize. 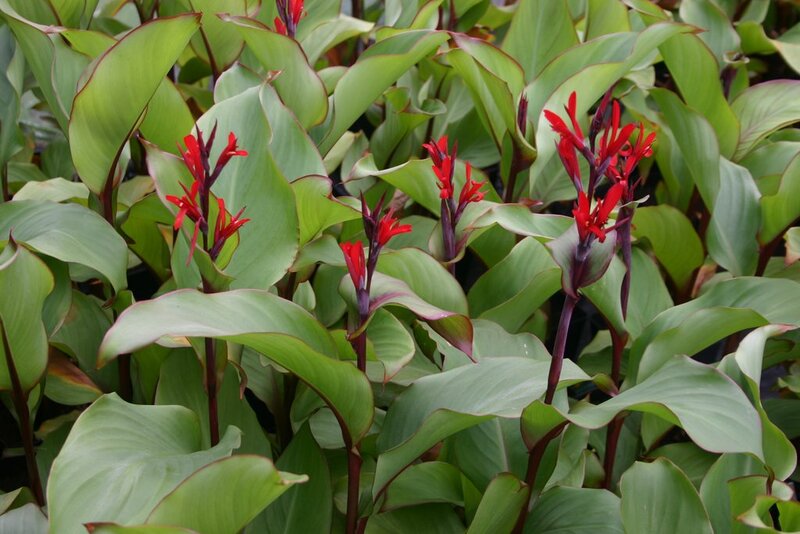 A very attractive fairly short species with olive-green wavy-edged leaves and small but brilliant red flowers. 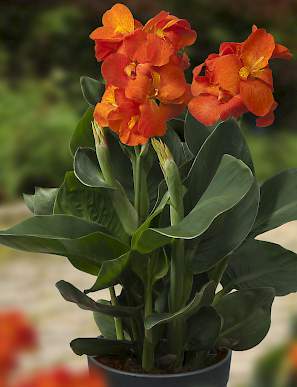 It is quite distinct, and is garden-worthy both for flowers and foliage. The red seed pods are also distinctive. Note: the name is pronounced "var-shay-vishi-eye". 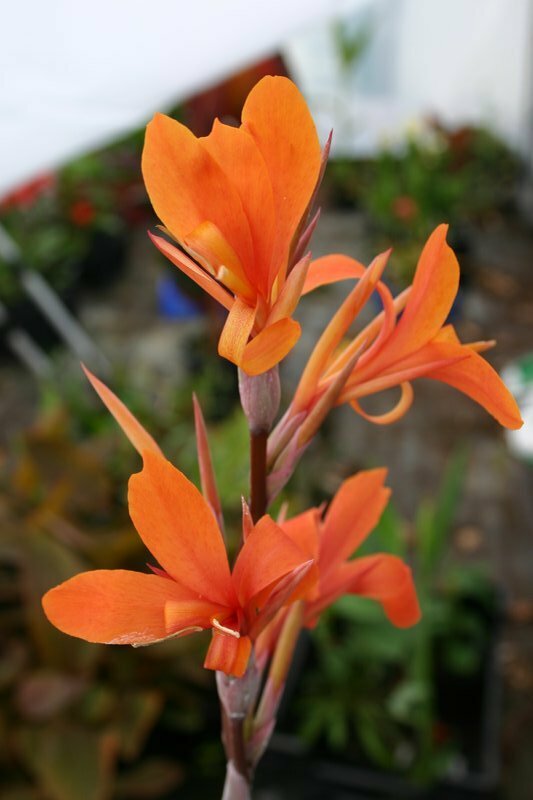 We have also seen this species sold under the name 'Hot Shot' which is easier to pronounce. Date: Friday 23 August 2019 to Monday 26 August 2019. Time: 10.00am to 4.00pm . Access for wheelchairs (except for toilet). plenty of parking. 1. All the cannas of our catalogue, plus other cannas from our National Collection of Cannas, plus any other varieties that growers care to send us. 2. 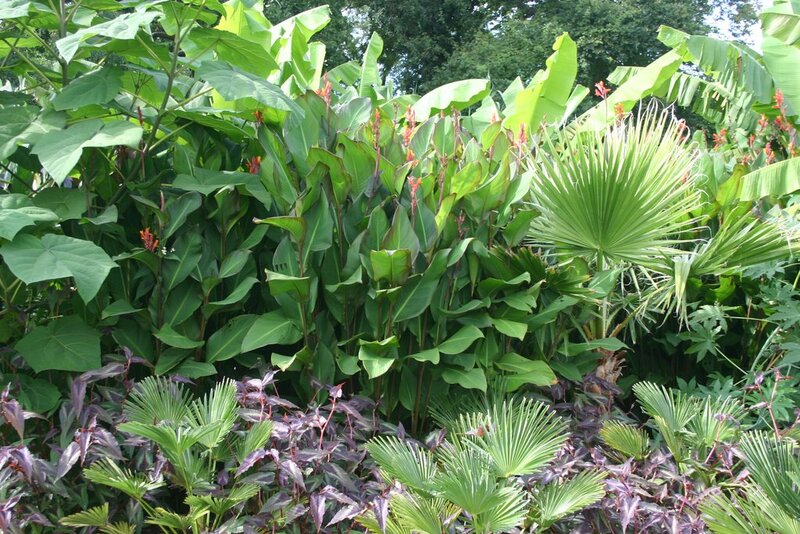 Dave and Celeste will be showing their collection of other sub-tropical plants, such as colocasias, alocasias, gingers, bananas, etc. HAMPTON COURT PALACE FLOWER SHOW 2 to 7 July 2019.